Does the Zoe work as a family car? 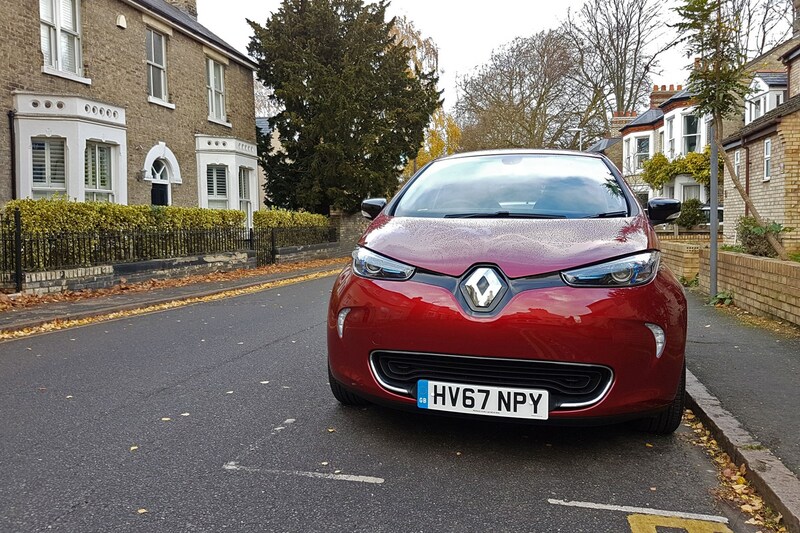 This week's update: All the latest on life with our Renault Zoe long-term test car - how easy is it to live with an electric car, and is it really the future? We find out. 7. Kangoo ZE 8. Pod Point fixed 9. Stress-free driving? 13. Q90 vs R110 14. Family car? I’ve waited ages for this moment. Finally, with the introduction of the Renault Zoe ZE 40 in 2017, there is now an electric car that makes enough sense that I’m able to run one as a long-term test vehicle without worrying that I’ll be forced to flagellate myself on a daily basis. A lot of very convincing people reckon electric cars are the future. Could we now be at the point at where this actually starts to be true? As a committed petrolhead in most other circumstances – including my latest long-term van, as it happens – I reckon I’m well-placed to rationally find out. What’s different about the Zoe ZE 40? The big deal with the new 40 version is the battery density. 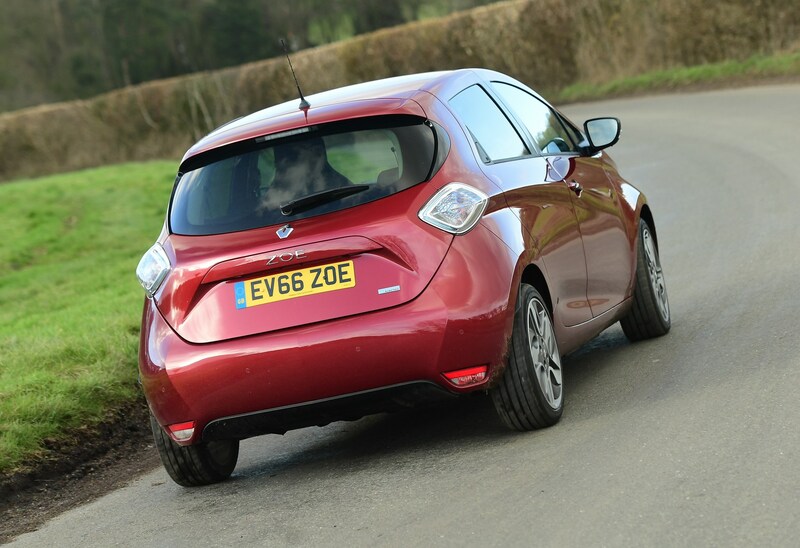 The battery pack in this Zoe doesn’t physically take up any more room than in previous versions, but the amount of energy the batteries within it can store is nearly doubled. 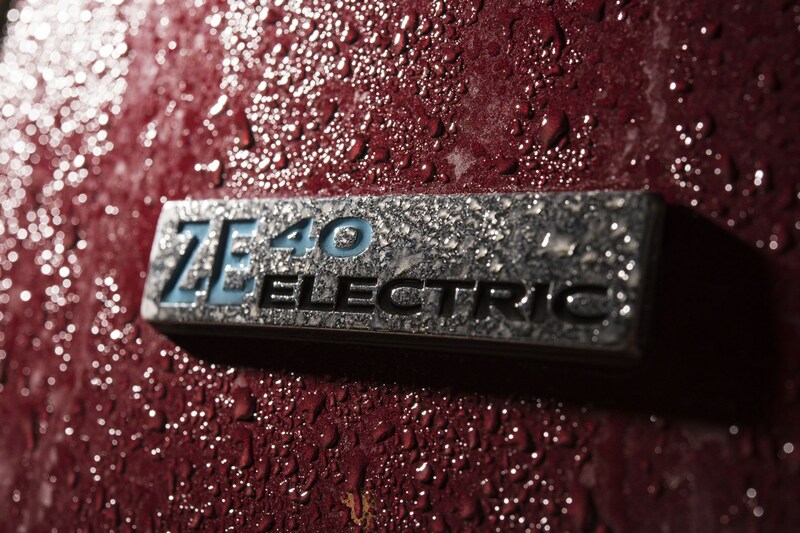 The 40 in the name stands for 40kWh, in direct correlation to this – whereas prior Zoe battery packs are only rated to 22kWh. 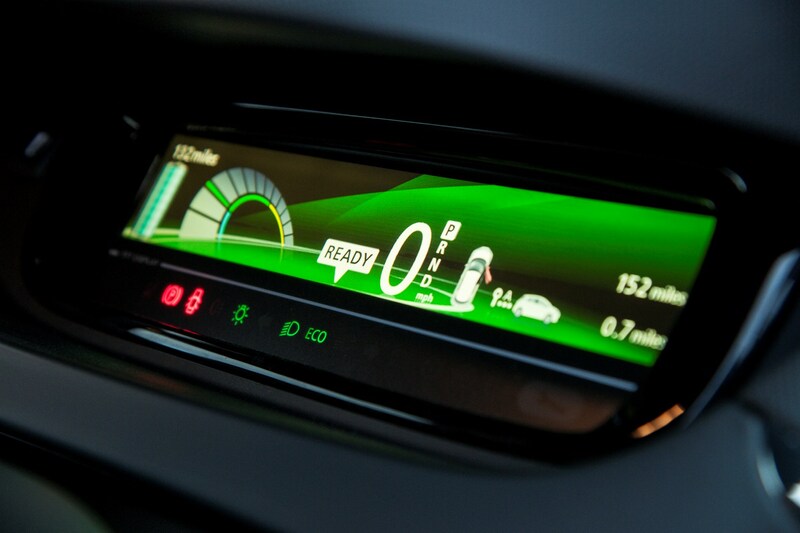 The practical upshot of this is that the Zoe ZE 40 has a maximum claimed range of 250 miles according to the official NEDC standard – an increase of 101 miles over the 149-mile official distance of (still available) 22kWh models. Suddenly, electric-only motoring looks practical. In reality, Renault reckons up to 186 miles from the new battery is a good result – such is the difference between real-world driving and the test procedure. Even so, that’s comfortably enough for my 70-mile round-trip commute from Cambridge to Peterborough and back every day. Anything else new for the latest Zoe? Making things slightly more complicated, our long-termer is a Zoe Dynamique Nav Q90 – where the Q stands for Quick Charge. The regular R90 model is the bigger-seller, apparently, but the quick-charging function is also new for the ZE40 revisions, so we thought it was worth closer examination. As the name suggests, it means faster charging – but only when plugged into a suitably punchy public charge-point. Given enough juice, this new 43kW system will service the Zoe with an 80% charge in just 65 minutes. 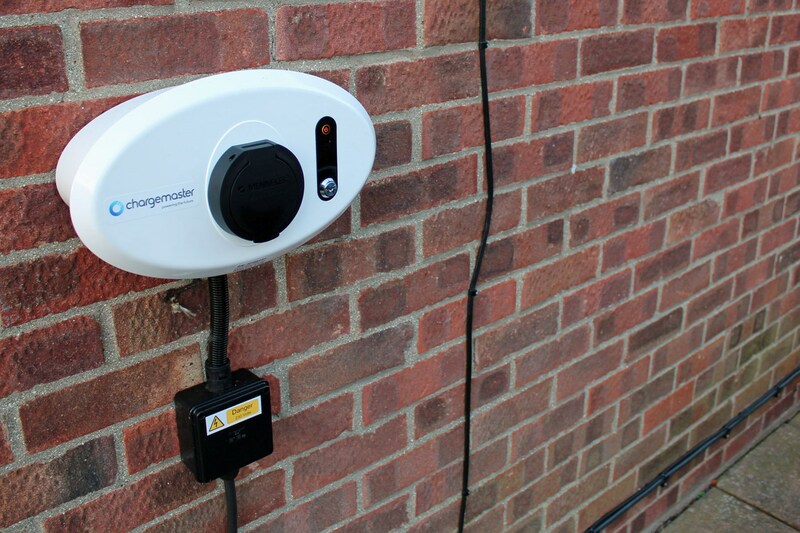 Connect to a UK domestic supply using a three-pin plug, however, and all that expanded battery capacity means you’ll need a spare 30 hours for a full top up. Thirty. Hours. Fortunately, Zoe customers get a home wallbox charger as part of the package, which delivers 7kW of power and needs around six hours for the whole cannoli – my mistake; it's officially 8.25 hours for the Q90. Still easily achievable when parking overnight. Any other differences between the Zoe Q90 and R90? Going Q does cost you 4hp – the ‘Q210’ motor in the Q90 producing 88hp compared to the R90’s 92hp ‘R240’ motor. But that’s not likely to keep me up at night. Especially as you get the same instant 220Nm of torque on all versions. And an identical 13.5-second 0-62mph time. Perhaps more pressingly, the Q part also reduces the maximum driving range slightly – to 230 miles NEDC. This is a projected 174 real-world miles according to Renault, not enough of a difference to concern my daily travel plans. The only other noticeable change for the 2017 Zoe is that the exterior badges are now silver, rather than lightly tinted blue. 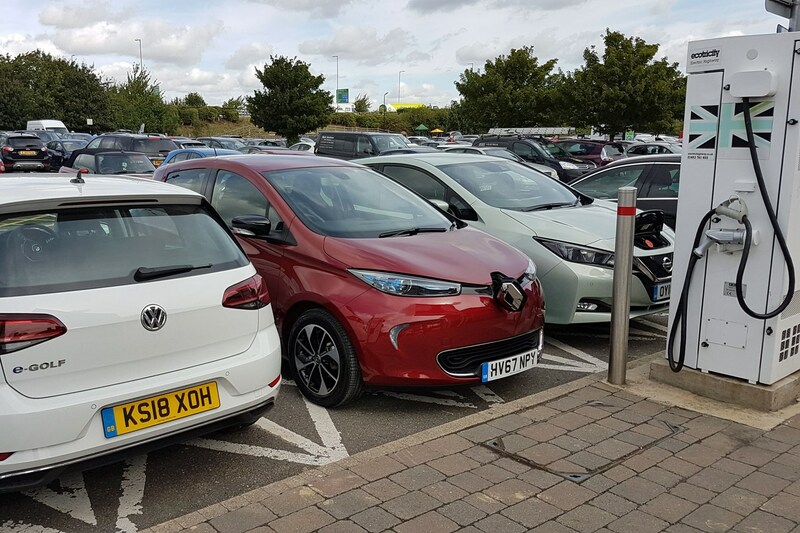 This is all part of the process of ‘normalising’ the electric car – or so Renault UK EV guru Ben Fletcher told me, as he talked me round the car when handing it over. Dynamique Nav trim is firmly mid-spec, but includes enough kit to avoid any sense that you’re being hard done-by, and the Nav part means satellite-navigation is standard. As befits an electric car, this will help you find a charging point if your planned journey suggests you won’t make it on the remaining battery range. In other words, it’s well-equipped right out of the box. That said, we have gone for £650’s worth of new Mars Red metallic paint – which I was expecting to be similar to that popular Clio shade, but actually seems both darker and smarter – plus a rear-view camera and heated seats, extras that cost £250 a piece. The heated seats might seem a bit indulgent, but even with the Zoe’s standard-fit heat-pump technology (on which more another time, if I can find anyone who actually understands it) they’re more efficient at warming the front occupants than running the air-conditioning. And as we’ll all no doubt come to learn over the next few months, efficiency is everything when it comes to living with an electric car. Ah, that old chestnut. 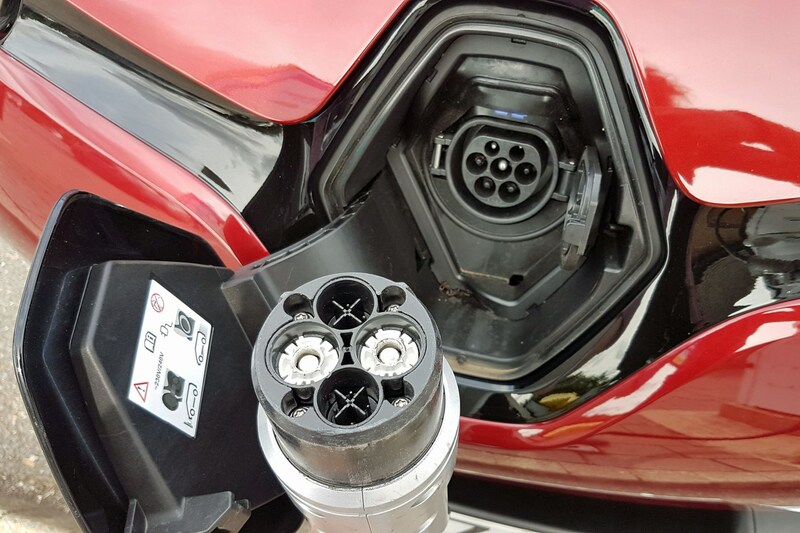 Indeed, Renault persists as with its unusual separate battery lease system for its electric vehicle range. So while this particular example is £18,920 on the road – increasing to £20,070 with the options as tested – that does not include the cost of the battery pack, which requires an additional monthly rental fee of £59 minimum in 40kWh guise. That price restricts you to 4,500 miles a year, too – with every additional 1,500 miles required adding £10 to the price (although if you’re prepared to pay £110 a month, distance becomes unlimited). The idea is that if you lease the batteries, you’ll always be covered against any problems relating to battery deterioration – and make no mistake, EV batteries, like every other rechargeable kind, do lose capacity over time. So while you can buy a Zoe outright, batteries included, when those batteries eventually start to fail – which is to say no longer charging beyond 70% capacity – you’ll be facing the full cost of replacing them, and they’re only warrantied for five years or 60,000 miles. But if you’re leasing, this becomes Renault’s problem. How is life with the Zoe so far? We’re still just getting to know each other at the moment, but if first impressions are anything to go by, I have to confess I’m rather smitten. I love the smooth, refined driving experience. 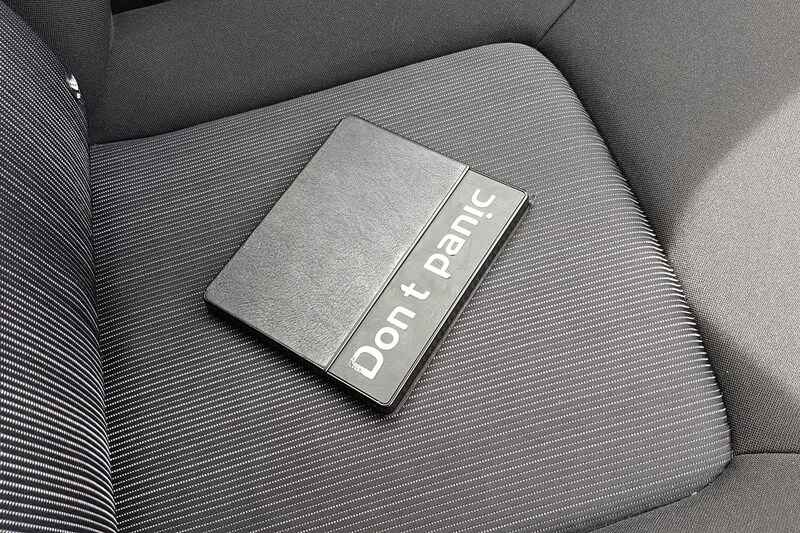 I honestly think it makes me calmer behind the wheel. I’m not so keen on the inconsistent low-speed braking performance, which I guess is something to do with the energy recuperation process, but we’ll see if I get more used to this over time. I’ll only be doing regular journeys to start with, but we’ll be testing the Zoe’s longer-distance capability in the future as well. Update 2: What'll she do, Mister? At this point, I could make some kind of a-chargin’ pun to bring us up to date with the general rise of electrification in cars (sales increased 35% in 2017 compared to 2016), but when it comes to all-electric cars like the Renault Zoe, I was thinking of a different kind of change. Used to be when people saw you had a new car they wanted to know how fast it would go – as per the title phrase, generally shouted out by grubby urchins keen to thrill their mates with knowledge (unsurprisingly, this actually happened several times with my old white car long-termer). But when it comes to EVs, when someone asks ‘What’ll she do?’ they’re usually referring to how far you can go before the batteries run out. Range anxiety by proxy, if you like. 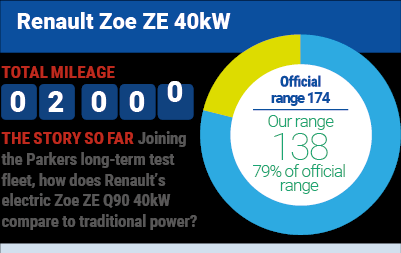 So, how far can you go in a Renault Zoe ZE 40 before the batteries run out? As hinted in the introductory report, this isn’t a straightforward question. 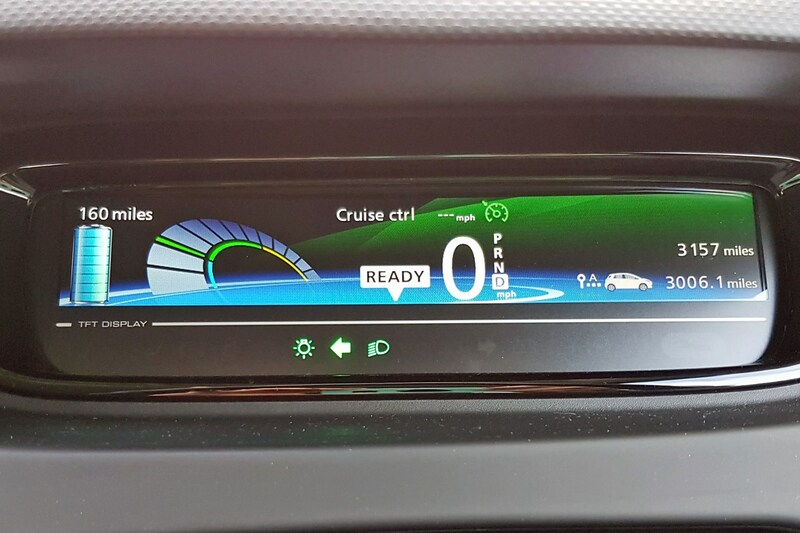 The official driving for the Q90 quick-charging model I’m running is 230 miles – but that’s according to standard EU testing procedures, and Renault is sensible enough to provide a more convincing real-world driving estimate of 174 miles as well. However, that’s not the end of the story, because the 174-mile estimate is for summer driving. Winter is much harder on electric vehicle batteries – physically, and in terms of the demands of heaters and such like – to the extent that Renault predicts 112 miles per charge is good going. But before you throw yourself out of the window in fear (that range anxiety by proxy again), think about how often you actually travel more than that distance in a typical working day. Because one of the joys of running this Zoe is that I can plug it in every night when I get home, knowing that I’ll have a full tank all over again in the morning. All without having to bother with stopping at a filling station. How accurate is the predicted range in the Renault Zoe? Turns out that 112 miles is a pretty pessimistic assumption from Renault anyway – at least in the UK. 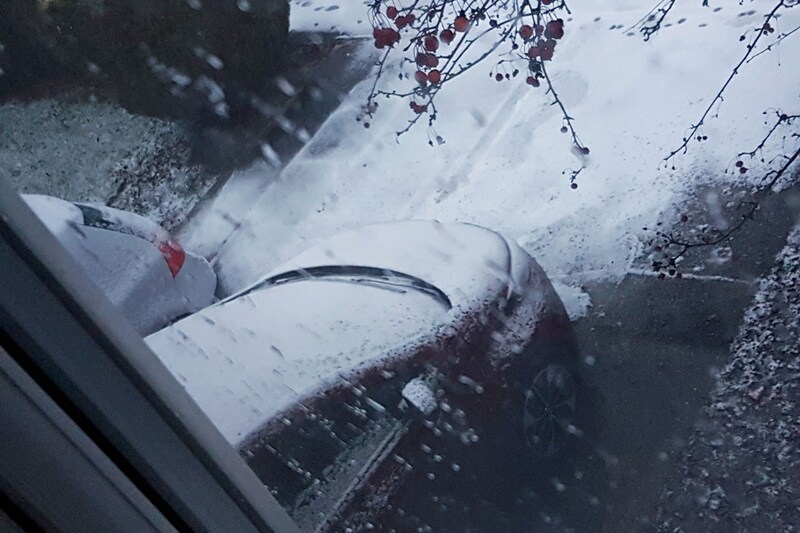 While I have seem that little range on the dashboard the morning after a full overnight charge, that’s only been on occasions when I’ve forgotten to set the pre-heating system during a period of snow, and turning up the air-con to deice the car has immediately knocked 20 miles off the prediction for the day. It’s much more typical for the Zoe to predict 122 miles or 136 miles at the moment – depending on the ambient temperature. On a particularly mild day last week it even went as high as 145 miles, which bodes very well for the onset of spring. Better yet, the remaining range gauge on the dashboard display is proving reliably accurate. To the extent that if the Zoe says it can travel a particular distance, I’m already confident that it really can – which is not something I’d say about many conventional fuel range displays. How you drive it does make a difference. 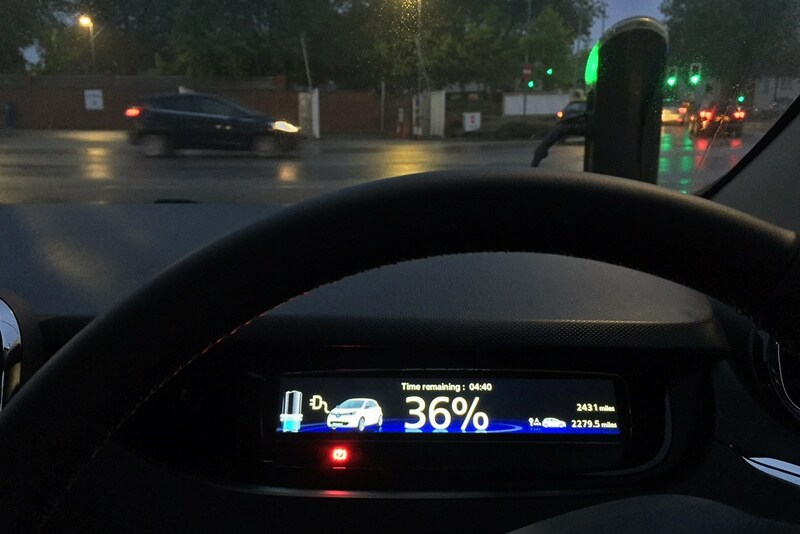 The Zoe has an Eco mode, which modifies everything from the accelerator response to the intensity of the air-conditioning, and I’m using this most of the time. Switching Eco off and keeping up with faster motorway traffic will take ever-larger chunks out of the predicted range as you go quicker and quicker – but since I know that my daily commute is less than 70 miles I also know I’ve got plenty of range to spare from a full charge to exploit in this way if required. What was that about a pre-heater? Renault calls it Comfort Heating, and it means you can set the temperature you’d like the interior to be and the time you're setting off, and the on-board computer will make sure it’s all ready to go as soon as you walk out of the door. This saves a useful amount of time. Better yet, pre-heating uses electricity not from the car’s batteries but from the plug – maximising the distance you can travel away from it. And how is the electricity bill? Well, that is a good question – and the truth is I haven’t had one since the Zoe arrived, so I can’t tell you. Yet. I have had a meter installed on the charger connection at home, however, so I can see exactly how much juice the Renault is using and will be able to calculate its exact running costs in time. Especially as – for reasons we’ll get to in the next report – I have been charging exclusively from my household supply for now. Update 3: Charge me up, please? 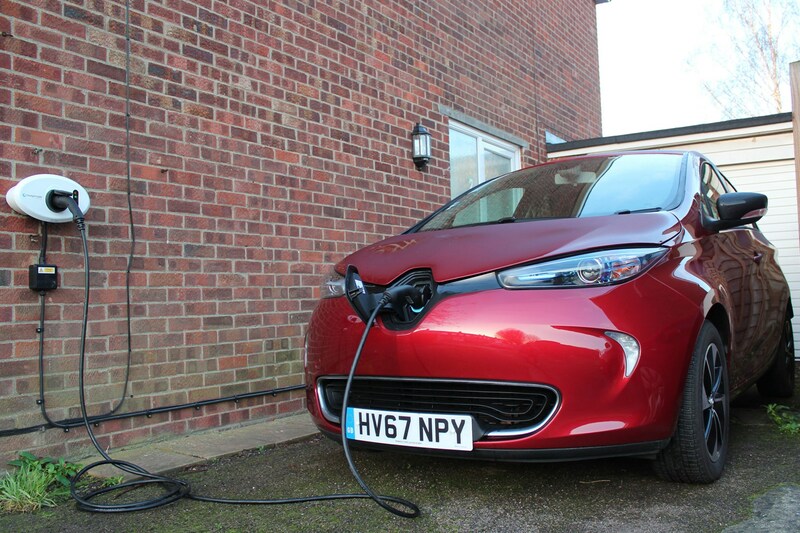 At the end of the last report I mentioned that at the moment I’ve been exclusively charging the Zoe at my house. Partly this is because I want to establish exactly what the per-mile running costs are – I have a dedicated meter on the Wallbox connection so will be able to work this out precisely. Partly it’s being enforced, because the Zoe presently will not cooperate with the Pod Point electric car charger we have here at work. 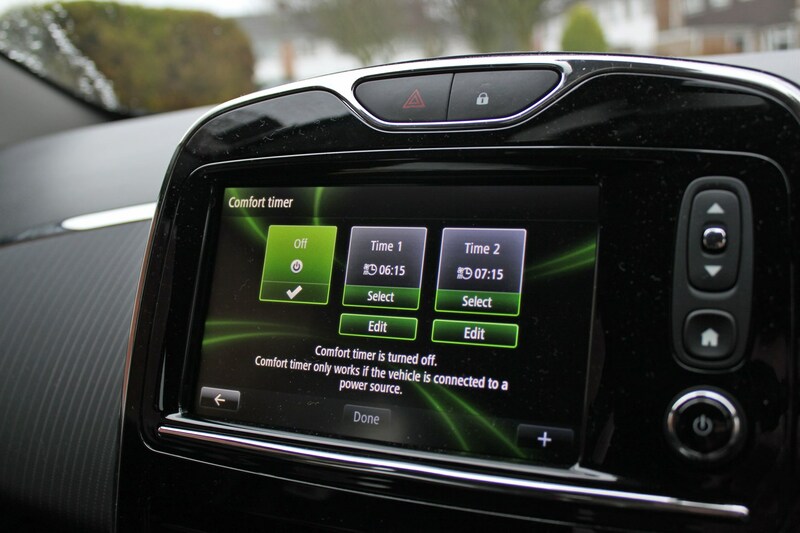 How do you get a Wallbox charger for the Renault Zoe? Not being able to charge the car at work might seem like a massive faff, but it isn’t – because the Wallbox works brilliantly. And every Zoe buyer gets one for free. A substantial chunk of the cost of this is covered by a government grant, and Renault picks up the rest. 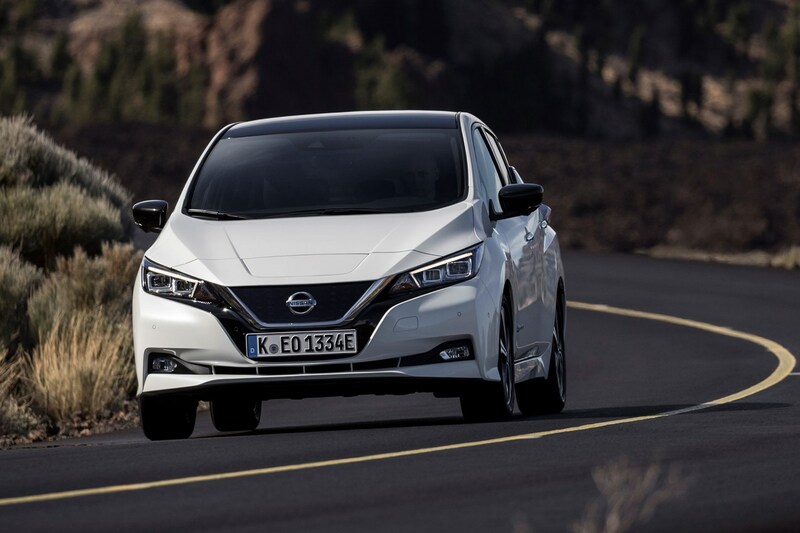 It’s a great scheme that really should help incentivise the sale of electric vehicles; Nissan is doing something similar for buyers of the second-generation Leaf. What was the Wallbox installation like? In the Zoe’s case, installation was handled by Chargemaster, which managed to send me about half a dozen copies of its introductory email, which wasn’t the greatest start. Then after establishing that I’d like an on-site survey before committing to the charger’s location, I waited in all day for an engineer who didn’t turn up, and didn’t let me know he wasn’t coming. Gladly, the second booking went much better – to the extent that I was expecting a mere survey and ended up getting the charger installed there and then. A very neat job is was, too, despite the challenge of my fusebox being located about as far from the exterior of the house it possibly could be. I rather like the look of the Wallbox itself. 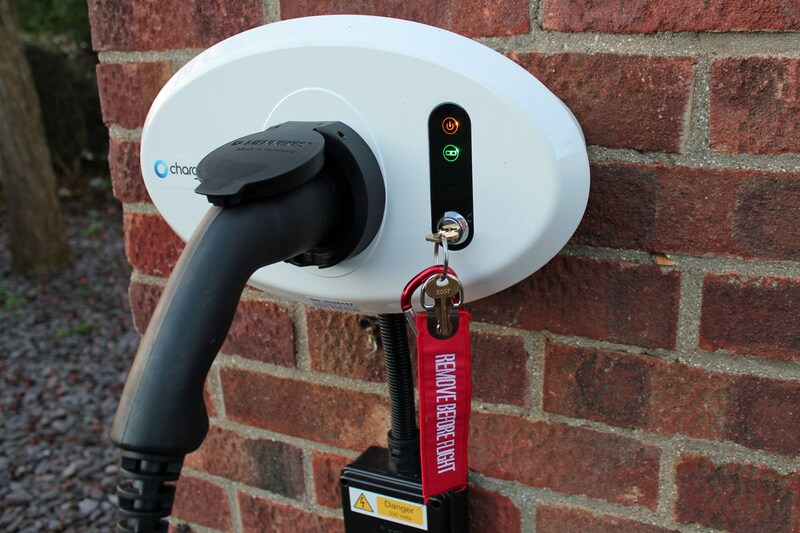 Chargemaster claims it’s the smallest on the market for its 7kW capability, and in addition to its pleasingly egg-like appearance it has a lock to stop other EV owners sneakily topping up their cars while I’m out. You can have one with an integrated cable, but I think without looks neater, and it means I’m not restricted to a single socket output design. Useful when I may be able to use it to charge other electric test vehicles as well. 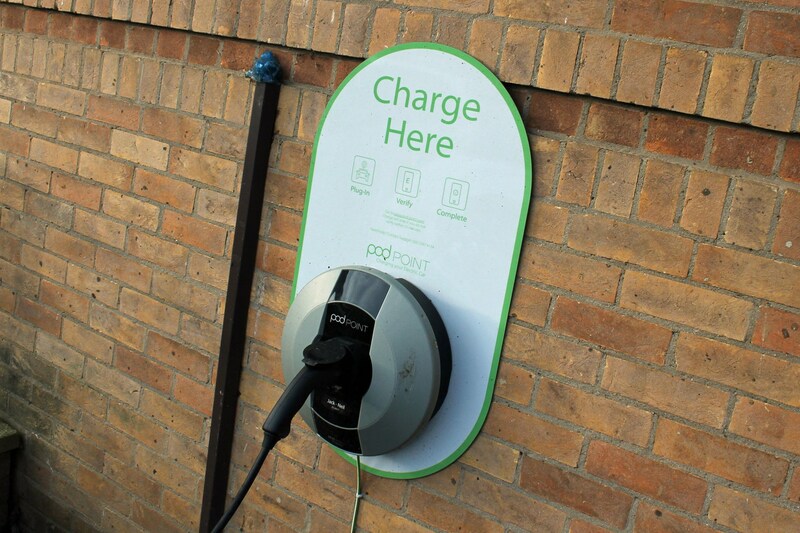 Why won’t the Zoe charge on the Pod Point? It’s a good question. If only I had an definite answer. To be clear, it’s not just this Zoe – we’re tried three of them so far, and none of them will charge on this Pod Point. 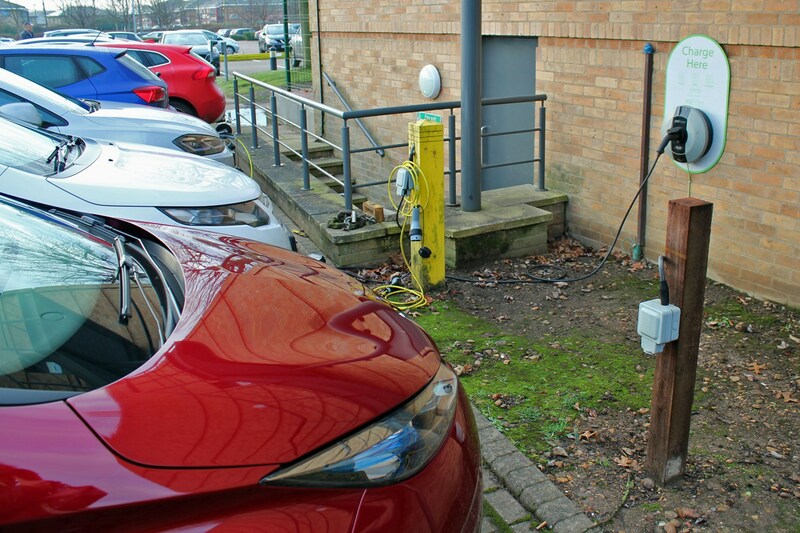 However, colleague Tim Pollard’s Tesla doesn’t have the same problem, and nor do any of the other electric cars that frequent our work car park. 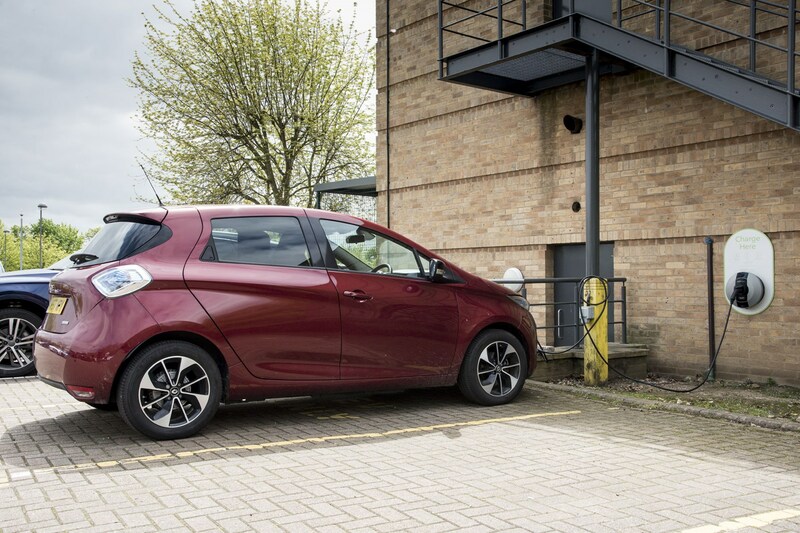 The issue seems to lie with the Zoe’s charging criteria, as it turns out the Renault performs more safety checks on whatever it’s about to draw large amounts of power from before commencing that process. This would therefore suggest the Zoe is detecting an issue with the Pod Point the other EVs are ignoring. Pod Point, however, has checked the charger remotely and reckons everything is working as it should. 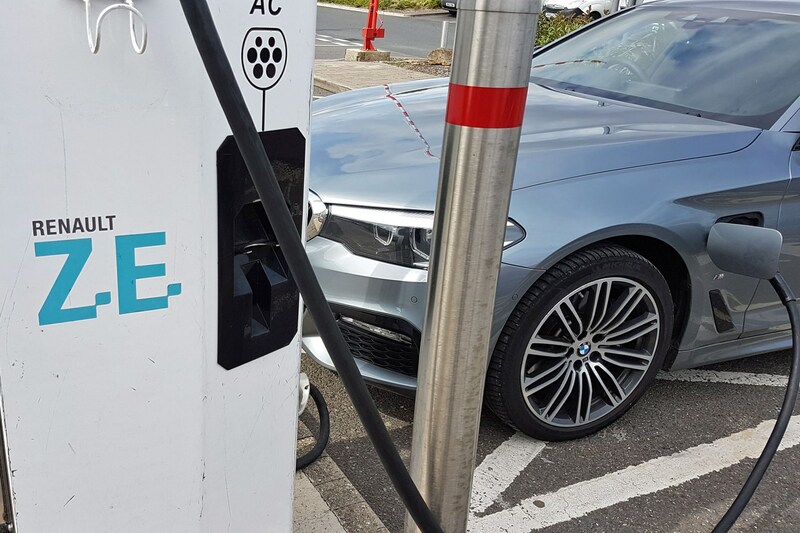 Leaving us at a bit of an impasse – though Pod Point has promised to do some further investigation to see if there’s anything it can tweak. Given all that, how’s the range anxiety? I know it’s traditional to attempt to write some kind of dramatic, knife-edge, will-I-won’t-I make it home type of piece (and I promise I will do exactly that if I ever end up in such a situation), but I am now completely confident that if the Zoe says it has the range to complete a journey it really does. I did have an occasion early on where I’d got back from a launch and come in to the office to collect the Zoe, only to discover my colleagues had left 44 miles of range on it for my 33-mile journey home, which felt a little close for comfort, especially on a Friday night. I may even have thrown a few proverbial toys out of my proverbial pram. But then I thought, sod it: in terms of percentages, that’s actually a pretty big margin for that journey, and actually, I am confident the Zoe genuinely means it. So in the end I just got on with it. I did get stuck in traffic, which just proved the battery consumption is fundamentally zero in those circumstances, but with a considered driving style and constant cruising, I had nearly doubled my spare range to 20 miles by the time I reached my drive. Since then, I’ve been cured. Mirror, mirror on the wall - which is the best electric car of them all...? I have been cheating on the Renault Zoe. This is a constant problem for motoring writers, of course, where there is almost always another car to drive instead of the one you routinely have at home – but in this instance I’ve been playing away with a particular heartbreaker, as far as the Zoe is concerned. Which is to say I’ve been driving the second-generation Nissan Leaf. This is a sensitive area for the Zoe, because not only is the Leaf a younger model – albeit one that technically competes in a different class of car – it’s also a distant relation. Renault and Nissan are Alliance partners, after all. So you’ve got to think they share some electric vehicle tech, even if they don't openly admit it. But whatever that situation, it’s the differences between these two EVs that I found most interesting. 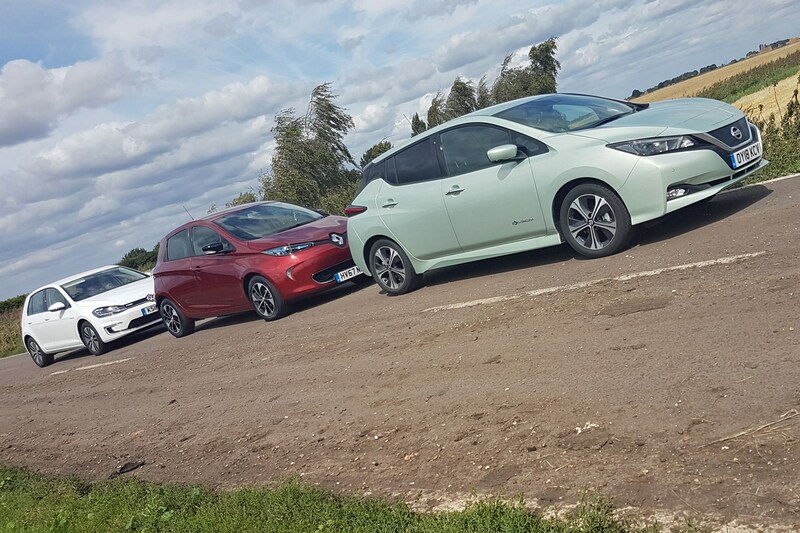 What’s the difference between the Renault Zoe and the Nissan Leaf? There are plenty of ends to pull at here: the barebones minimalism of the Zoe’s interior versus the techy modernity even the toned-down gen-two Leaf is doused in; the Renault’s smooth, voluptuous looks versus the Nissan’s punky sleekness. 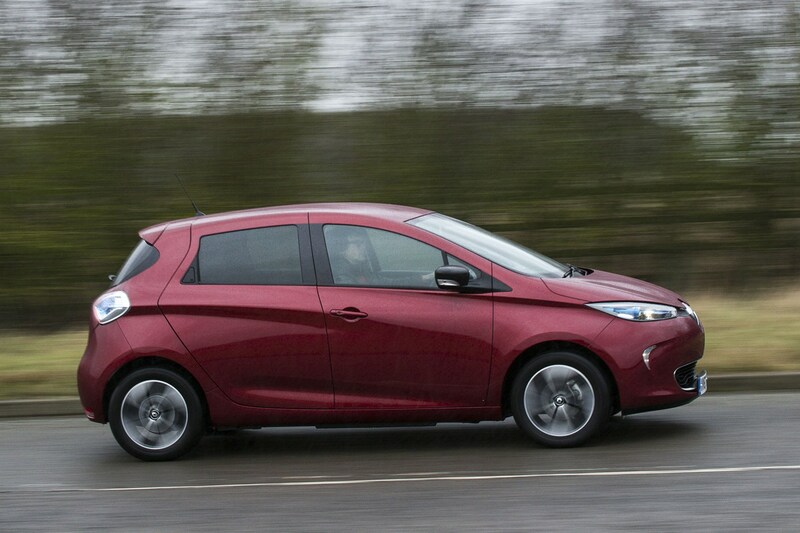 Not to mention how the Zoe is a supermini and the Leaf is a family hatchback. But the one that’s really, really noticeable is the difference in the driving experience. This is not so much a difference in how they drive – they’re both quiet yet whizzy proponents of calm that handle neatly yet not especially enthusiastically – rather a difference in how you drive them. I’ll explain. Renault has very consciously decided that electric cars need to be simple. If people are going to get used to something new, you might as well make it as easy as possible for them. 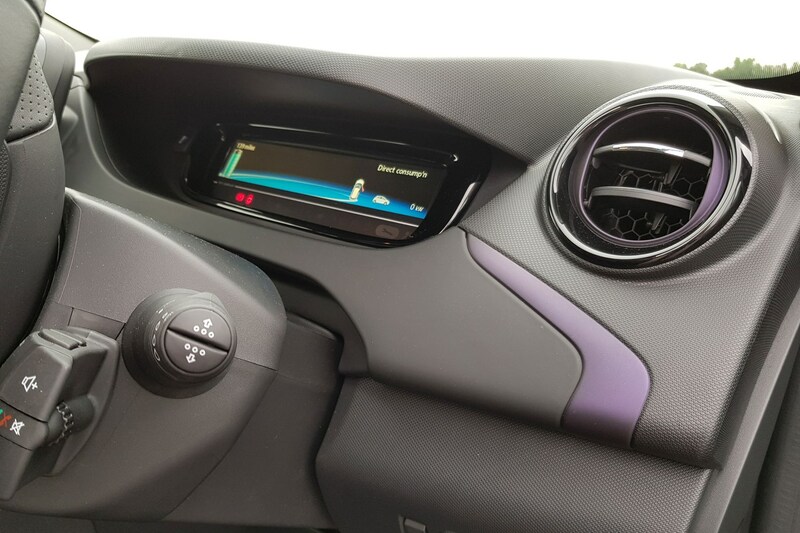 As such, the Zoe has an on button, and a drive selector like an automatic gearbox that gives you a choice of Park, Reverse, Neutral and Drive. 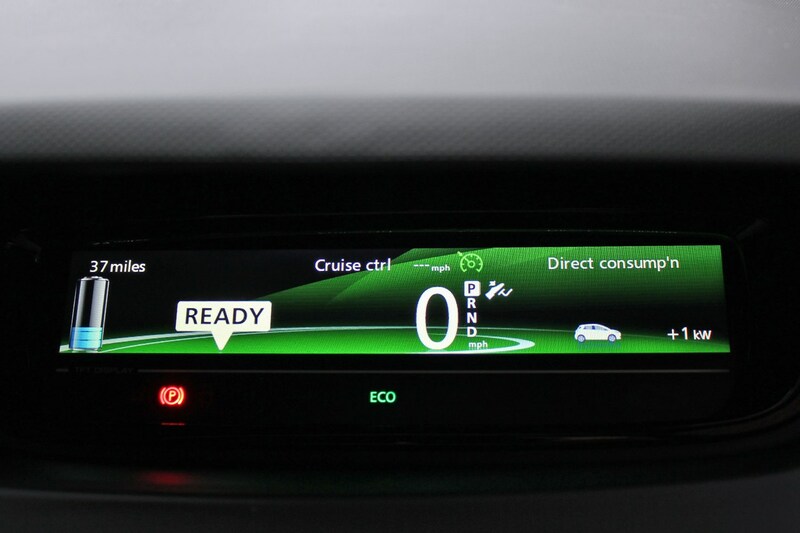 There is also an Eco button, which knocks performance back a bit for maximum driving range. But that’s it. Pull the level into Drive, release the parking brake and go. Simple. Nissan has chosen a different path. The automatic gearbox process is similar, except that you get a puck-shaped thing rather than a more traditional lever, and an additional forward driving mode labelled B. This stands for Brake (I assume) and adds a shot of additional braking effect whenever you lift off the accelerator. 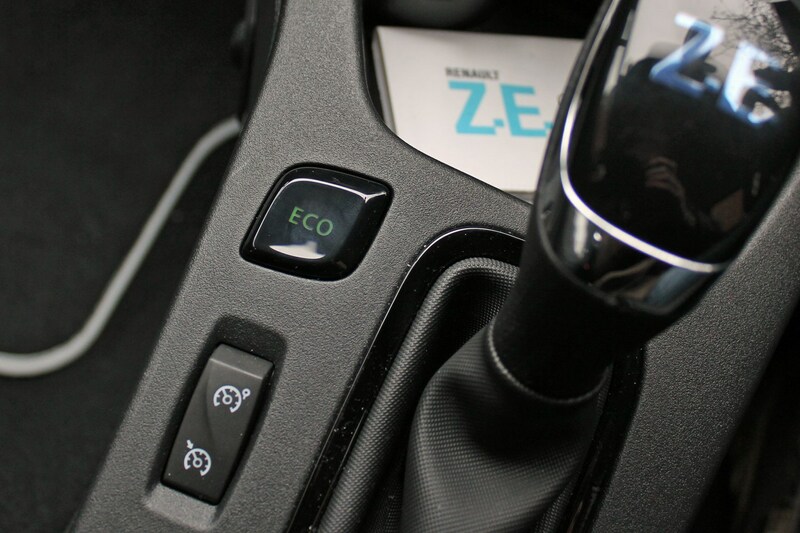 Located next to the puck is an e-Pedal switch – a bit like the release for an electronic parking brake in form – and on the far side of the steering wheel there is also an Eco button, which has a performance-restricting role like the one in the Renault. What the hell is an e-Pedal? It’s an understandable question, and Nissan will be pleased you asked because it’s trying to convince you it’s done something new here. Which it sort of has. 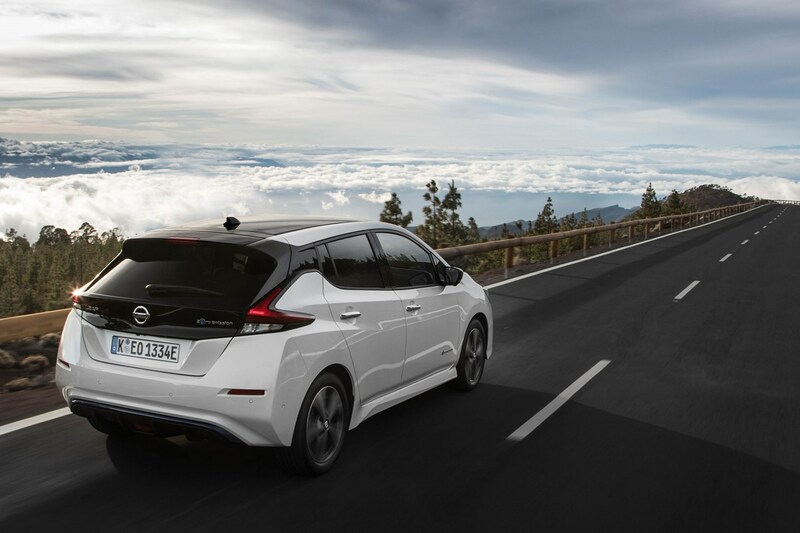 Activate e-Pedal in the Leaf, and you get even more of a braking effect when you come off the accelerator than you do with the B mode – both systems largely rely on drag from the electric motor going into generator mode to slow the car down. And because this is how the slow down is happening, the process recuperates electrical energy to recharge the batteries, albeit very gradually. But, e-Pedal can even bring the Leaf to a complete halt if given enough notice (because it ultimately controls the conventional friction brakes once you’re going very slowly as well), and lifting off the accelerator suddenly is similar to jabbing the brakes. Though you're unlikely to be that sharp with it in most situations. 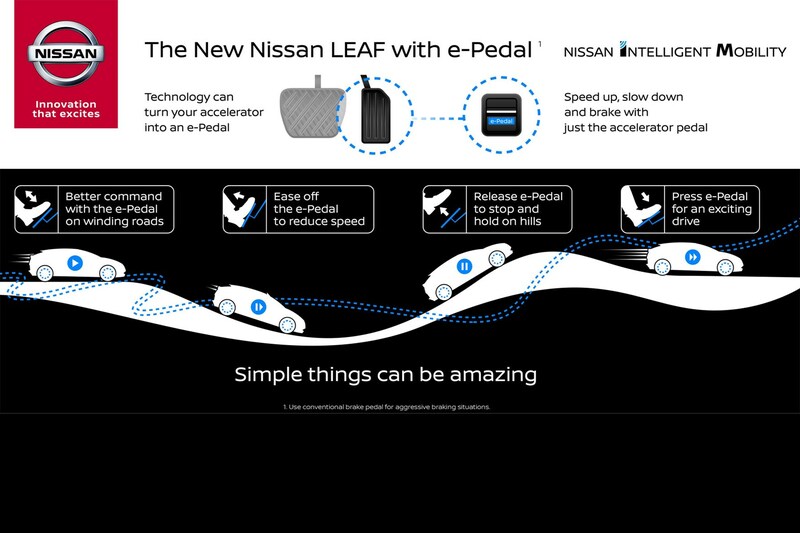 The idea is that with a bit of practice, e-Pedal will allow you drive the Leaf using only the accelerator. This so-called one-pedal driving process is both highly efficient in terms of energy use, and will save wear and tear on your brake pads, helping them last even longer than they already do in a typical electric car. It does. Almost too well. What I mean by that is most of the time I found the Leaf smoother to drive without e-Pedal engaged. It was useful when trying to reduce speed for a particularly tight corner, but usually I’m minded to drive with enough anticipation that letting off the accelerator in normal Drive (let alone the B mode) would reduce my speed enough to cope with an upcoming bend. The e-Pedal comes more into its own around town, where stop-start congestion means traffic flow is less consistent. But still I found I didn’t want it on all the time. And because you need to find the little separate button for it, the e-Pedal isn’t as easy to use in a flexible manner as it could be. I found myself pining for the paddleshifters some rivals employ to vary the braking effect in their electrified models – which seems to be a much more intuitive implementation of an analogous concept. But what about the simple Zoe? That’s the other thing. 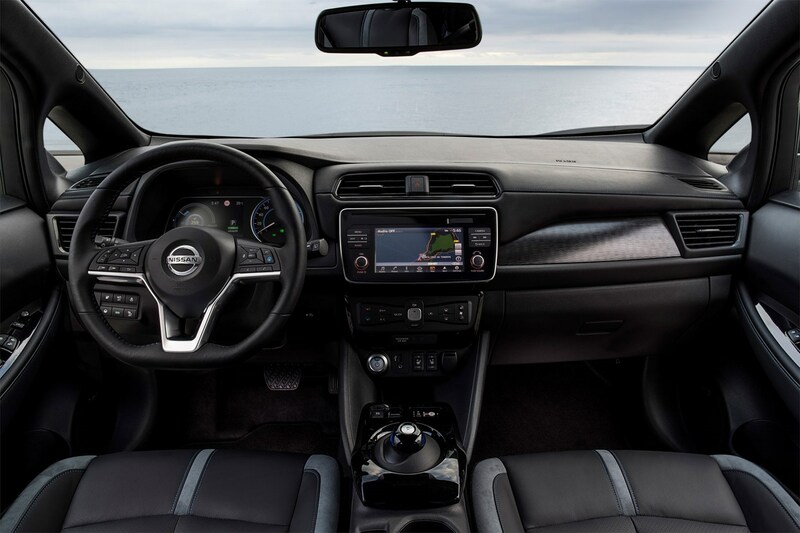 Because the e-Pedal is there in the Leaf, I did find myself wanting to use it –despite the slight frustration with the manner of switching it on and off. In the Zoe, this frustration doesn’t exist, because the extra complexities of the driving process don't, either. And, more significantly, I don’t miss them. For while there is a certain satisfaction to be had from interacting with all those driving modes in order to try and achieve the best possible efficiency in the Leaf (and maybe it should be noted that on the Leaf launch my driving partner and I covered 53 miles on just 3% battery loss – though that did partly involve a 2000m descent down the side of a volcano, which saw regen from 33% battery remaining to 47%), the effort quickly becomes tedious and tiring. Life with the Zoe means I just get in and drive. And I have to say I really rather like that. 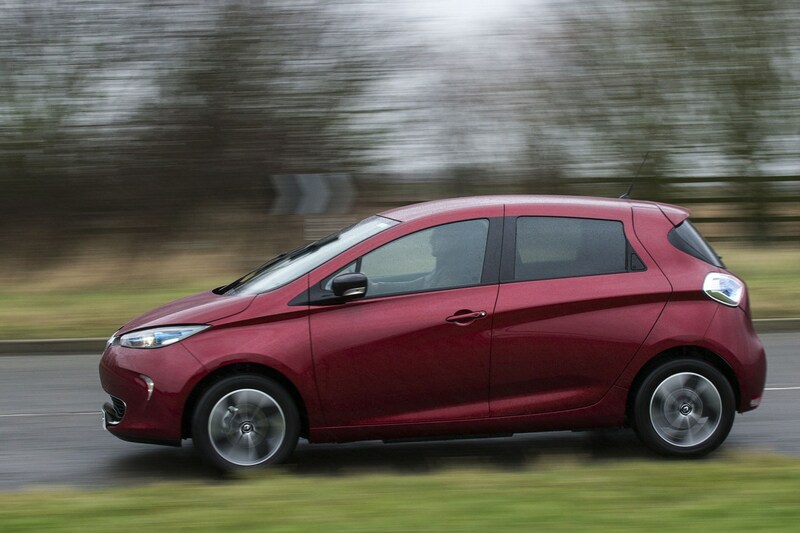 The first electricity bill is here - how much does the Zoe REALLY cost to run? Here’s a moment of truth if ever there was one: I’ve got my first electricity bill since taking charge (groan) of the Zoe. And because, as I’ve already mentioned, I’ve had a separate meter installed on the connection for the home Wallbox that I’ve been exclusively using to keep the little Renault in juice, this means I can now work out exactly how much it’s costing in ‘fuel’. 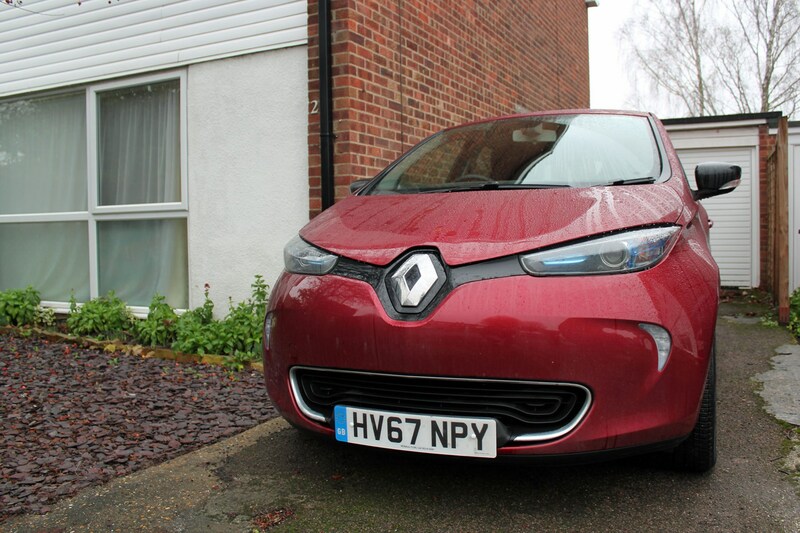 How much does the Renault Zoe cost to recharge? That particular question is a bit like asking how long is a piece of string, since obviously it depends on how run down the batteries are (and what your electricity tariff is). However, maths. Since its arrival in late in late November 2017, the Zoe has covered 966 miles and used 382.01kWh of electricity, mainly carrying me backwards and forwards to work. The unit cost for my electricity is 14.84p (excluding VAT at 5%) – which in turn means the Zoe has cost £56.69 to charge so far. Add the 5% VAT and you get a total of £59.52 (to the nearest penny). If you then divide that figure by 966 miles, you get a cost per mile of just over 6.1p. Given my typical journey to work is 33 miles each way – 66 miles in total – this means my daily commute in the Zoe costs £4.03 (with a slightly marginally rounding up of the £0.026 at the end there). Finally, I’ve charged the Zoe 13 times during this period (I don’t use it every day), and if you divide the total cost of £59.52 by 13 you get an average charging cost of £4.58. Phew. Is that the end of all the numbers? Numbers, yes – but there are a few other things about this worth noting. 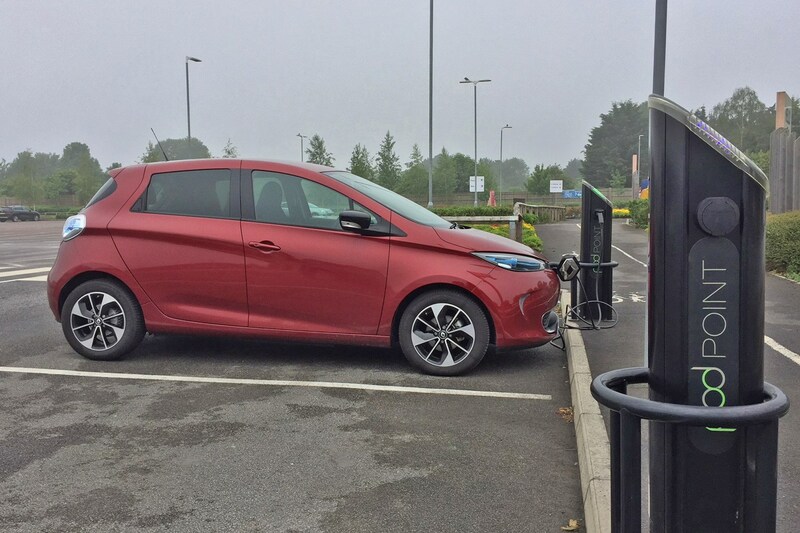 For all that the Zoe isn’t expensive per journey compared to a conventional car – and I’ll come back to that in the next report – the cost of charging it does represent around a third of my quarterly electricity bill. And that’s in winter, when we’ve typically got more things switched on in the house. The per mile calculations don’t include the daily standing charge, either; I’d be paying that anyway. Finally, being winter, the Zoe’s own efficiency isn’t as high as it could be. Running the heater takes energy, which increases the amount of electricity consumed – not only when driving but also when charging the car, as I’ve been making good use of the pre-heating system to make sure the cabin’s warm when I get in it in the morning. Once (if) spring finally arrives and the weather becomes milder, I’m expecting the per mile costs to fall. Look forward to more maths in about three months’ time. I know that I said in the previous report that you’d have to go a good three months before I inflicted any more maths on you, but I thought it might be fun to compare the Zoe’s cost per mile with some of the other similarly sized cars on the Parkers long-term fleet. But since our editor then pointed out that no-one really thinks in terms of cost per mile, we decided it would make more sense to compare journey costs instead – taking my 66-mile round-trip journey to work and back as the example, and using the real-world costs of our long-term fleet for comparison. 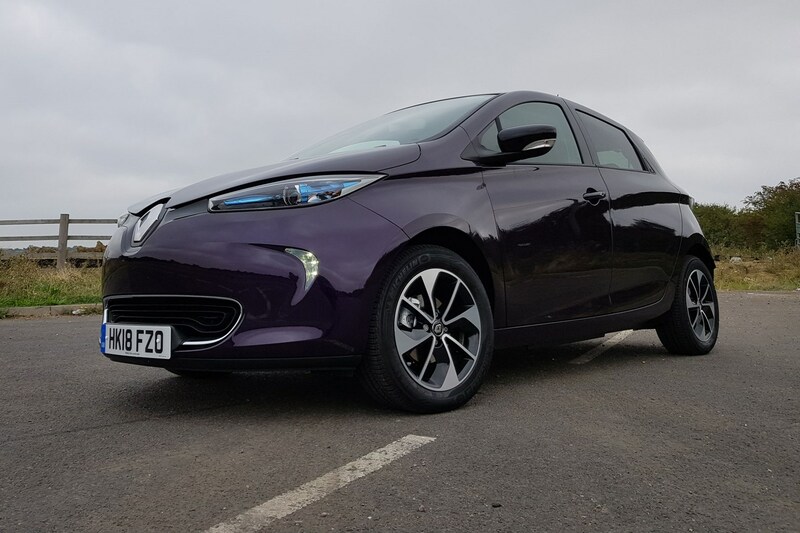 The Zoe’s considered an eco-friendly choice – the ZE in its name stands for zero emissions, after all – so let’s make the first comparison with Adam’s VW Golf GTE. The GTE is a bigger vehicle than the Zoe and produces a stonking 204hp compared to the Renault’s paltry 88hp, but it’s also a plug-in hybrid electric vehicle (PHEV), which combines a petrol engine with an electric drivetrain and a battery big enough for around 31 miles’ electric-only driving (according to VW; expect far less in reality). Next, let’s take a look at Gareth’s Toyota C-HR. Again, this isn’t a direct competitor to the Zoe as it’s a 122hp crossover, but it is a regular – rather than plug-in – hybrid, which combines a petrol engine with an electric motor and battery that delivers just short bursts of electric-only running. Judging by that, pure electric power is not only cleaner than hybrid, it’s also considerably cheaper – albeit for a slightly smaller vehicle. But what about more conventional fuels? Lawrence’s Citroen C3 is a supermini just like the Zoe, but it’s powered by a 100hp 1.6-litre turbodiesel engine. Finally, what about petrol? Percy runs a Suzuki Swift – which is a small, light, very modern supermini powered by an efficient 90hp 1.2-litre petrol engine, which is subsequently slightly hamstrung by being the 4x4 model. Victory for the Zoe, then. And just to make the advantage clear, multiply those commute costs by five for a typical working week, and then that by four to get an estimate of the monthly difference, and so forth. As I said, this is all decidedly unscientific – none of these cars are an exact alternative to the Zoe except possibly the C3, and of course each of us have different driving styles. But I think it does convincingly suggest that electric vehicle running costs are genuinely low. Finance Editor Chris reckons we should go further and calculate some total monthly costs including PCP rates and servicing. And as soon as he's done the maths on that, I'll report back again to see if the Zoe still makes the most financial sense. While I'm here, you might have noticed we now have a fancy new infographic at the top of this page, comparing Renault’s claimed range for the Renault Zoe Q90 with our actual range. I thought I’d better just explain how we’re working this out. Firstly, the official range we’re quoting is not the lab-based 230-mile NEDC rating, but rather Renault’s own real-world calculation, which is a best-case 174 miles for this Q90 model. Note that’s a warm weather rating; in cold weather Renault pessimistically drops this to 112 miles – which we’ve always exceeded. 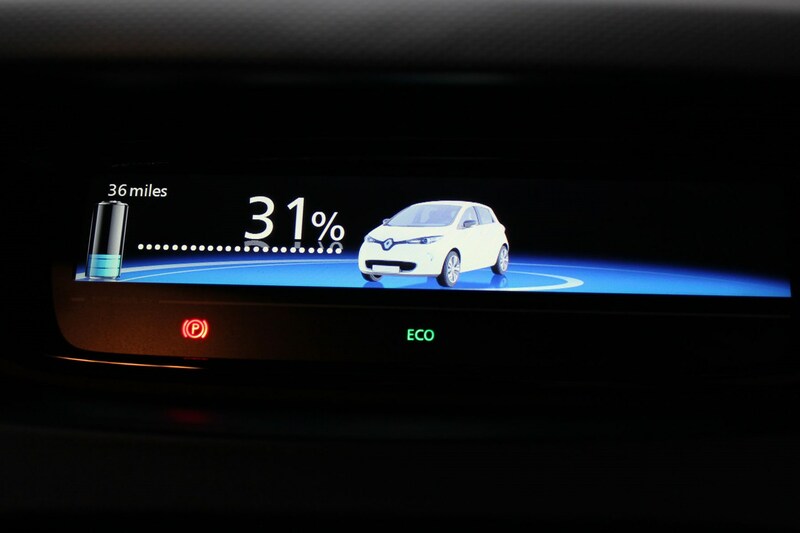 Secondly, we’re calculating our actual range using the Zoe’s built-in computer – based on the predicted driving range it displays when the battery is 100% full. To make it fair, we’re calculating this actual range from report to report, rather than overall, precisely because electric vehicle range is so influenced by weather. This way we’ll better reflect how far you can expect one of these to go at a given time of year. At the end of its time with us we will of course do an overall range calculation as well. Make sense? Do drop me a line if you think there’s a better way: @ir_427 on twitter. As I spend most of my time writing about vans these days, I guess it was inevitable that the Zoe would be meeting up with its more, uh, utilitarian cousin at some point or another. Thus here it is with the latest version of the Renault Kangoo ZE electric van. Renault has been building an electric version of the Kangoo small van since 2011, but in 2017 it gave the little load lugger a substantial upgrade – in the form of a new battery pack and motor combination, resulting in this Kangoo ZE 33 model you see in the pictures here. As with the ZE 40 bit of the Zoe’s name, the ZE 33 of the Kangoo denotes the new size of its battery pack in kilowatt hours (kWh) – enough of an upgrade in this instance to boost the official driving range from 106 miles to 170 miles. That’s a welcome increase of over 50%, and now makes the Kangoo ZE a much more viable proposition. The real world range is closer to 100 miles, of course, but if you need a small van and know you aren’t likely to exceed that distance within a day’s work, many of the same running cost benefits you get with the Zoe compared to a regular car also apply to the Kangoo versus a conventional van. How does the Kangoo ZE compare to the Zoe then? This is a little like comparing apples and orange, but having originally driven the Kangoo several months previously, I was surprised just how different the driving experience is. The Zoe, for example, never feels slow – obviously it’s no hot hatch, either, but it comfortably keeps pace with quick-ish motorway traffic. Well, as long as you’ve got the Eco mode disengaged and don’t mind sacrificing some driving range on the altar of (modest) performance. 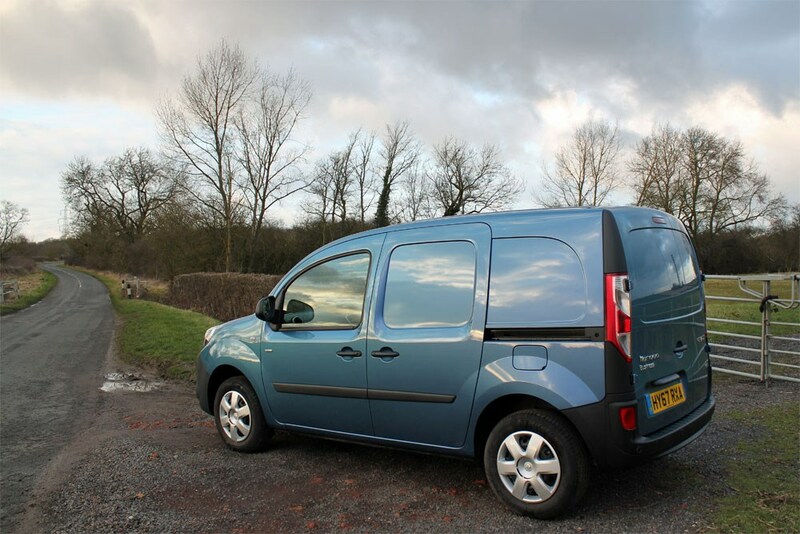 The Kangoo, on the other hand, can feel very slow indeed when it’s out on the open road. This is not something I’ve really been bothered by before when driving it in isolation. But compared to Renault’s electric supermini, you find yourself wondering what’s happened to all that instant torque. The problem is really one of ultimate horsepower; the Kangoo uses what Renault calls the R60 motor, while my Zoe is a Q90 – which gives the van just 60hp and the car 88hp. Seems a funny idea, giving the van less power when it can legally carry a 650kg payload. But vans are all about keeping the costs down, and around town – where the Kangoo is really designed to spend most of its time – it generally feels nippy enough. The Kangoo does have a greater level of regenerative braking to compensate, too. 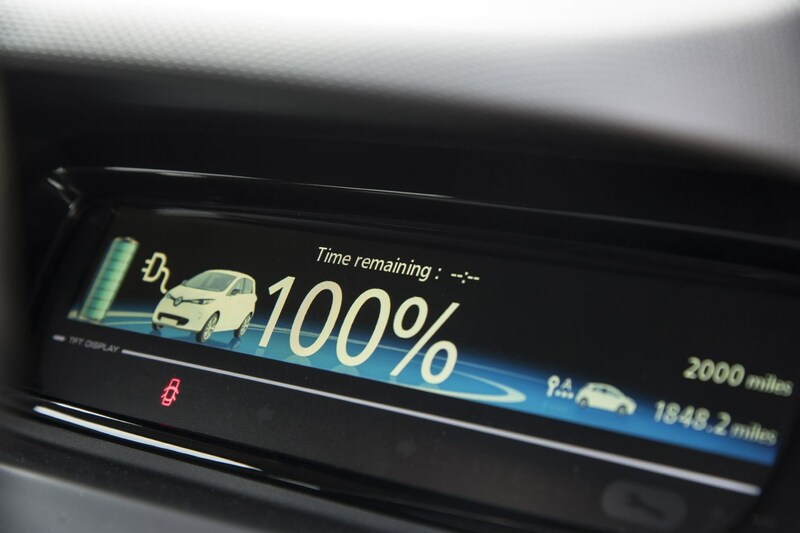 This means that like the latest Nissan Leaf, you can quite often drive the van using only one pedal, as lifting off the accelerator sees it slow down much more quickly than the Zoe does in similar situations – enough, in fact, to bring the Kangoo to a complete halt if you plan ahead. This process not only helps to keep the batteries topped up – the reduction in speed is caused by drag from the motor as it turns into a generator converting the slowing process back into electricity – it also takes some of the effort away from the friction brakes. Useful for effectively slowing heavy loads, and reducing running costs. Which, as you know by now, are all important in a van. 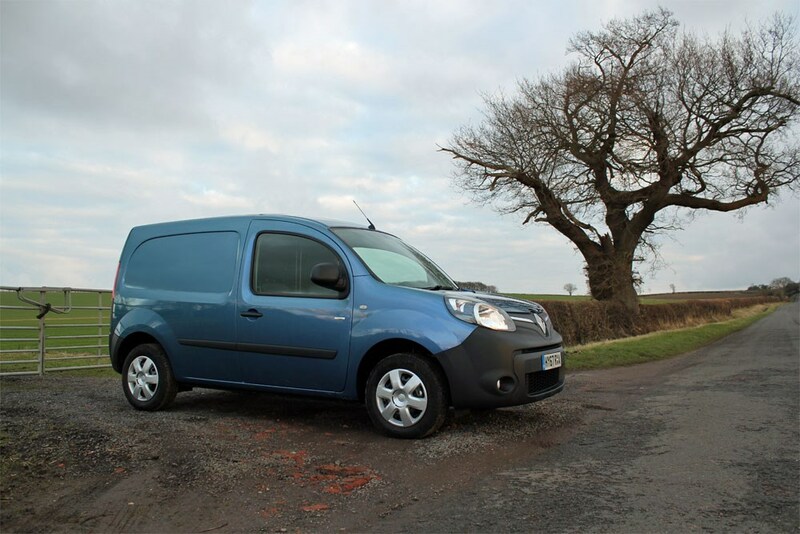 The more the motor brakes the Kangoo, the longer its actual brakes will last. The Zoe remains the neater handling machine, unsurprisingly, and of course it has a much plusher interior. The Kangoo being about as plain as you can get, even in the van world. 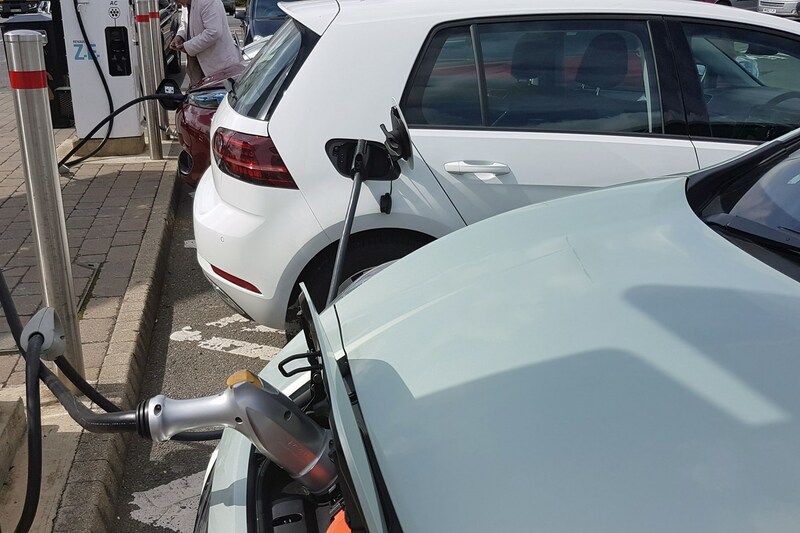 The most galling difference between the two, however, is that the Kangoo will recharge on the Pod Point at work, whereas the Zoe is still refusing to. What on earth is that about? It works! It finally works! 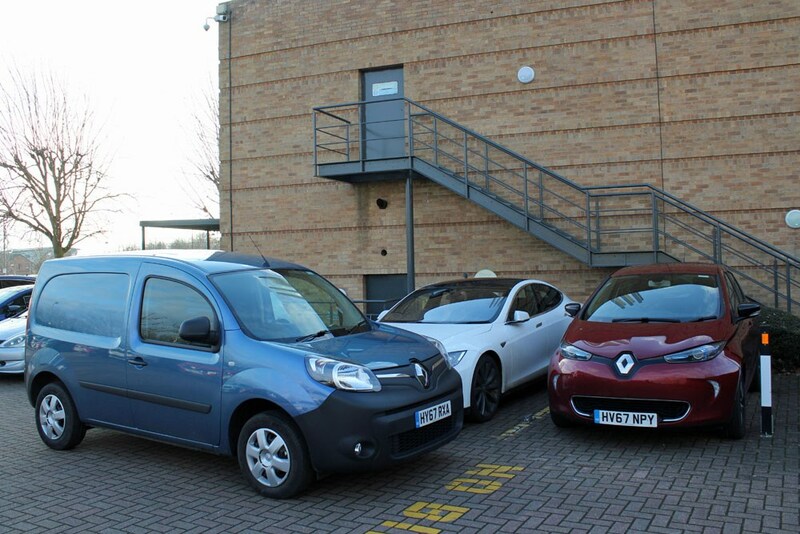 It took one of CAR’s designers mentioning to the site team that the magazine’s Tesla Model S was also refusing to charge (intermittently, rather than the Zoe’s permanent disgust), but the Pod Point here at Bauer Towers will now finally fill up the Renault. 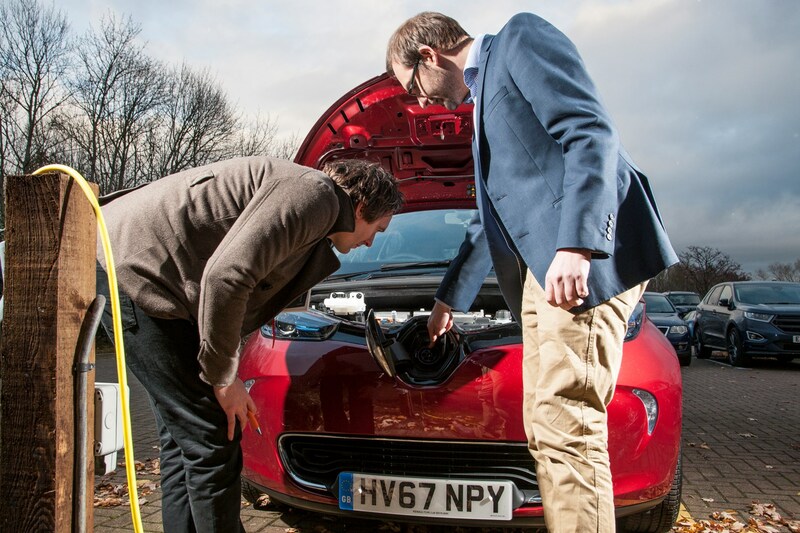 A pair of Pod Point engineers need only a morning to fix it; apparently – and perhaps unsurprisingly – the charger we have here was one of the firm’s earliest designs, which resulted in a whole bag of bits being removed and replaced by basically a single circuit board. Such is progress. Also perhaps unsurprisingly, it would appear that Renault was right, and the reason the Zoe wouldn’t charge is that it was detecting an earthing issue. 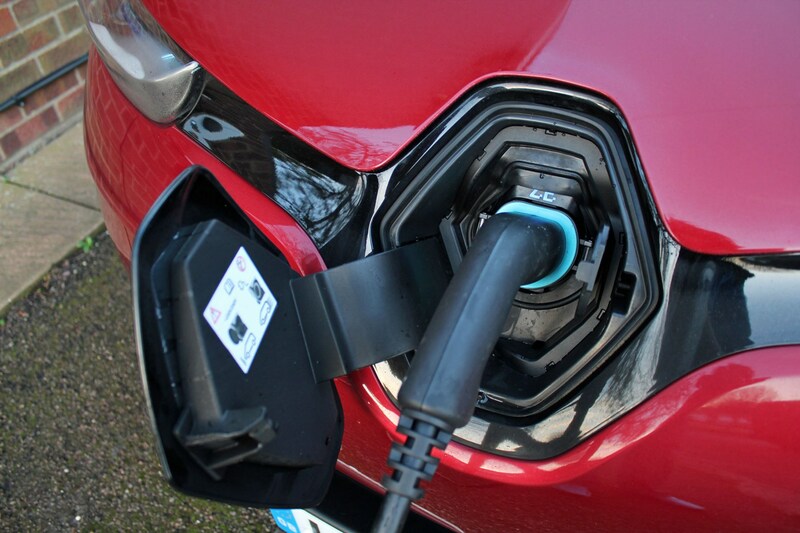 The French hatchback is, Renault admit, particularly susceptible to this, in part down to its AC (as in alternating current) charging system, but nonetheless, reducing the resistance on the Pod Point’s earthing has apparently solved the problem. 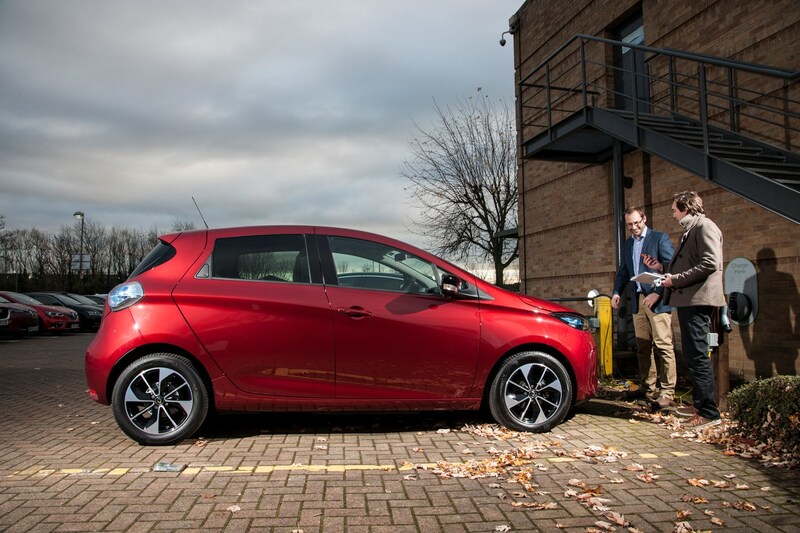 Which in turn makes it much easier for my colleagues without proper electric car charging wallboxes at home to try the Zoe, as they can set out with a full battery from work – which in all but a couple of cases should be more than enough for their commutes. Ironically, when Tim P plugged his Tesla back into the newly refreshed Pod, the Model S still wasn’t having any of it. But this turned out to be an issue with the cable, rather than the charger. Update 9: A survey says… electric cars reduce stress. But do they? Ah, the ever-churning cycle of press releases based on surveys. PR agencies love a catchy subject or some controversial results as a means of promoting the sponsoring business – I’ve received one just this morning about London motorists’ attitude to electric cars, and the dangers of performing basic maintenance on them. The accuracy of which presumably falls on your definition of ‘basic’. Pretty sure you’ll be able to top up the washer fluid without hurting yourself – no car maker is going to design it any other way. And it’s not like there’s oil to change in a car like the Zoe as it doesn’t have an engine. Anyway, I digress. 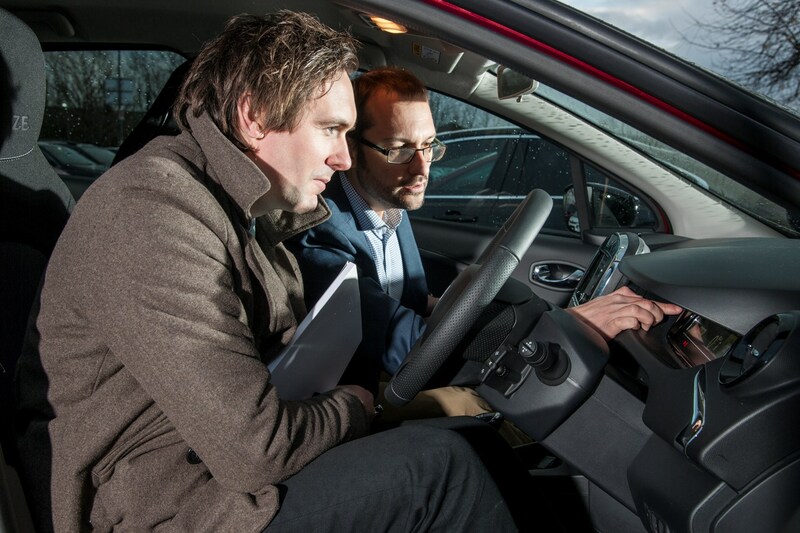 Earlier this week I also received a press release entitled ‘Electric vehicles reduce stress behind the wheel’. And the reason this one caught my eye is that I actually think it’s true. The release itself turns out not to be a survey but a study – albeit it a small scale one involving just four drivers / subjects. It also takes a broad view of electric vehicles, as it compares the new and old versions of the archetypal London taxi. 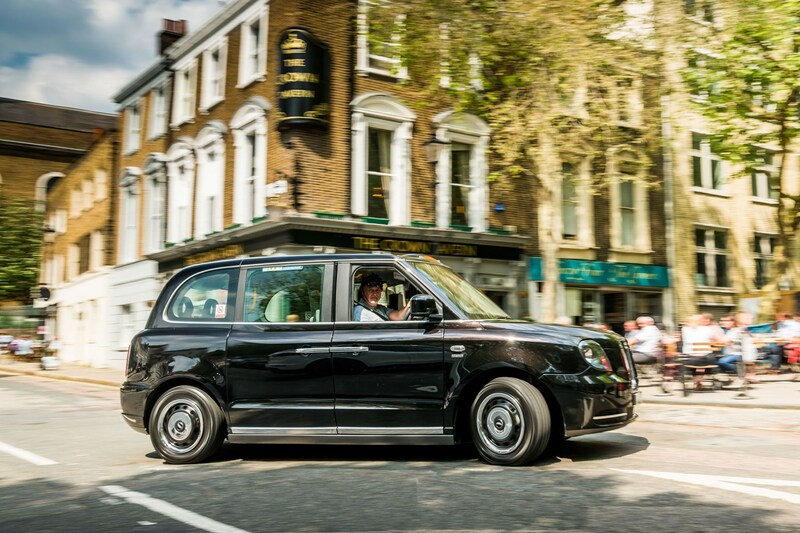 You’d be forgiven for thinking older London black cabs were so named for the soot coming out of their diesel exhausts, as they’re one of the major contributing factors to air quality concerns in the nation’s capital. But the new ones described as ‘electric taxis’ are in fact not fully-electric vehicles like the Zoe; rather, they’re plug-in hybrid electric vehicles (PHEVs) that rely on a combination of petrol and electric power. I’m digressing again. Sorry. The system nevertheless offers 80 miles of emissions-free running, and a claimed 377-mile total driving range, thus offering both eco-friendliness and flexibility. The study in question was commission by the makers of the new taxi, the London Electric Vehicle Company (LEVC), so we should probably approach its results with a pinch of salt. 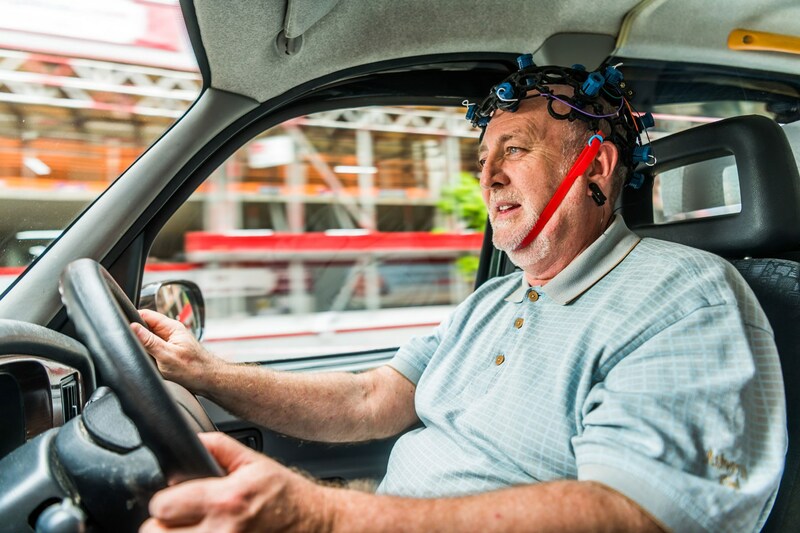 But the basic premise is that, after monitoring brain wave patterns (seriously), heart rates and so forth, when behind the wheel of the new electric cabs the drivers were found to demonstrate measurable reductions in stress and increased levels of concentration compared to the older diesel models. The drivers themselves reported ‘increased happiness’. Why would all this be the case? 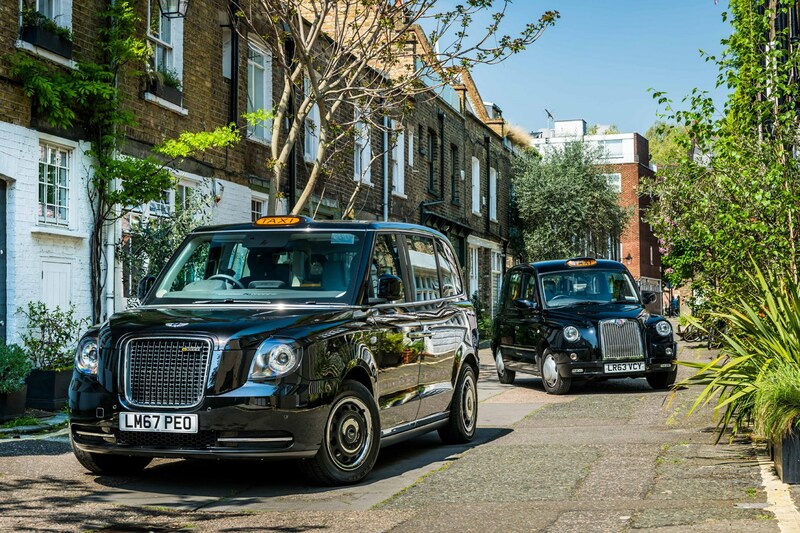 Largely because the electric taxi is quieter and smoother to drive, compared to the noisy, vibrating environment of a traditional black cab. Surely that’s good news for passengers, too. What’s all this got to do with the Renault Zoe? The study was commissioned to coincide with Mental Health Awareness Week 2018 (14-20 May), and frankly we could all do with paying a little more attention to things that help us keep our minds in a good place. More to the point, it really does echo my feelings about driving the Zoe. While I’d hesitate to suggest that I descend completely into a state of zen-like calm whenever I’m piloting the little Renault, driving it does have a noticeably positive effect on how I approach both the journey and – yes – other road users. Living in Cambridge, this is particularly apparent when coping with seemingly suicidal commuter cyclists, who often appear to have no concept of the raw physics involved should a lycra-clad body mis-judge cutting-up a tonne and a half of metal and plastic. I used to commute on a bike myself, so I’m not anti-cycling at all. But some people are plainly nuts. Or arrogant. I’m not sure which is worse. And you can hear the Zoe coming, thanks to its eerie low-speed noise generator. Argh. Digressing again. Point is, when I’m in the Zoe, this kind of thing just slides right by me – whereas it snags a touch more if I’m driving anything else. 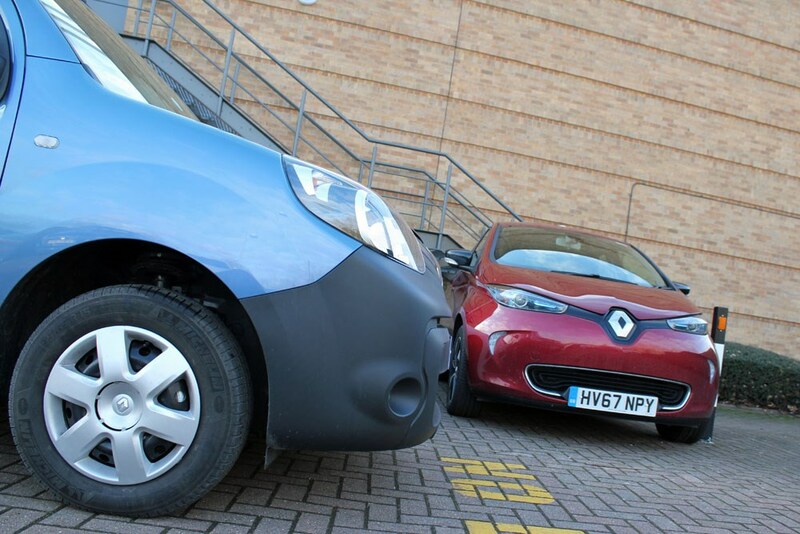 Why does driving the Renault Zoe make you feel calmer? I think it’s a combination of factors, but essentially it’s because – especially around town – the Zoe is so quiet and effortless. The electric motor hums away without generating any vibration, while the direct drive of the single-speed gearbox means you get basically instant response at urban speeds along with hassle-free congestion capability. 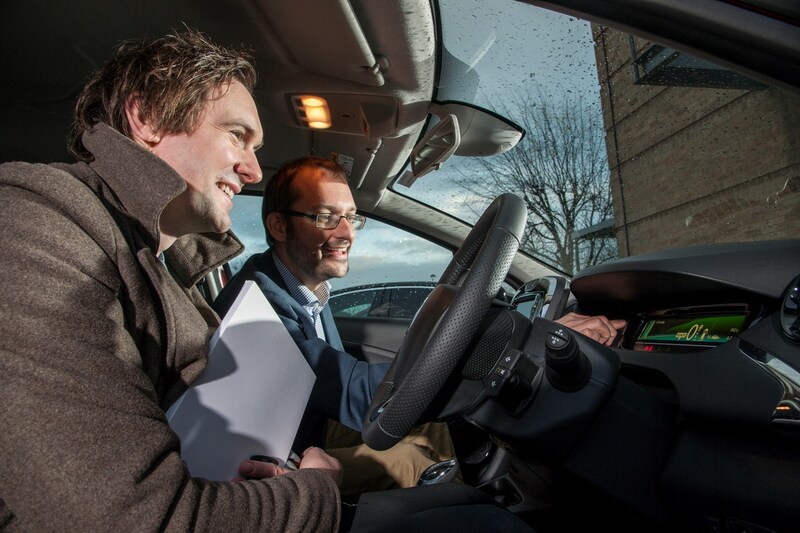 Pulling out of junctions or onto roundabouts you can be absolutely certain that you’re going to get the nippy acceleration you’re expecting – there are no variables caused by clutch control – and this together with the neat, sure-footed handling inspires confidence in cut and thrust traffic. It makes defensive driving a doddle, and while you do get a few people still automatically equating an electric car with milk-float grade performance, which occasionally leads to some aggressive tailgating, few underestimate the Zoe’s ability to get out of their way twice. It really is quite quick within the bounds of city speed limits. That you’re also cruising around producing zero local emissions – the modest humming noise serving as a constant yet subtle reminder of this – shouldn’t be underestimated, either. Smug, yes, but soothing as well. When it comes to cars, I’m something of a Francophile, so when the Renault Zoe appeared on the market it didn’t have to work too hard to capture my attention. 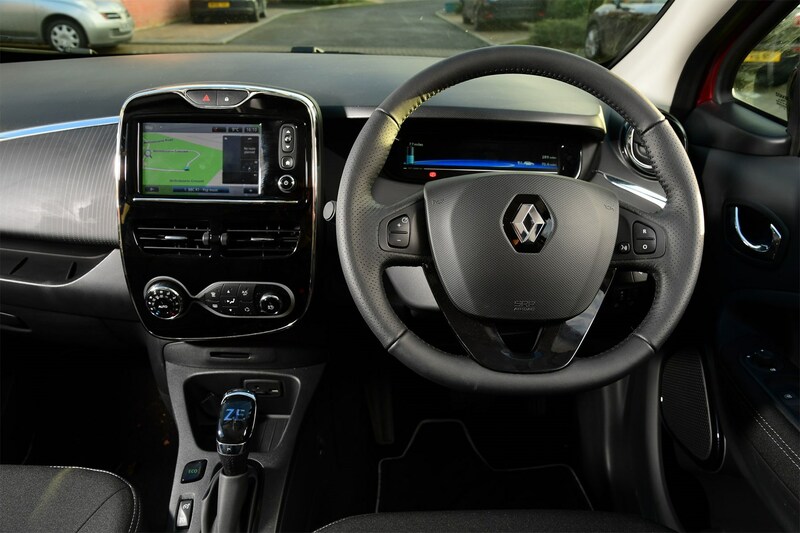 Pert styling that’s more interesting than the similarly sized Clio’s (to my eyes), a sleek, functional digital dashboard, easy to manoeuvre in city streets and, most importantly, zero emissions (from the car itself) thanks to its electric powertrain. For me, the personal downside was that its real-world range made the 76-mile commute home tricky. And, even if I did manage to gently trundle all the way home, I’d be waiting the best part of 24 hours waiting for the battery pack to trickle charge back up again in order to get back to the office. Boo. But wait! Salvation is now here in two forms. 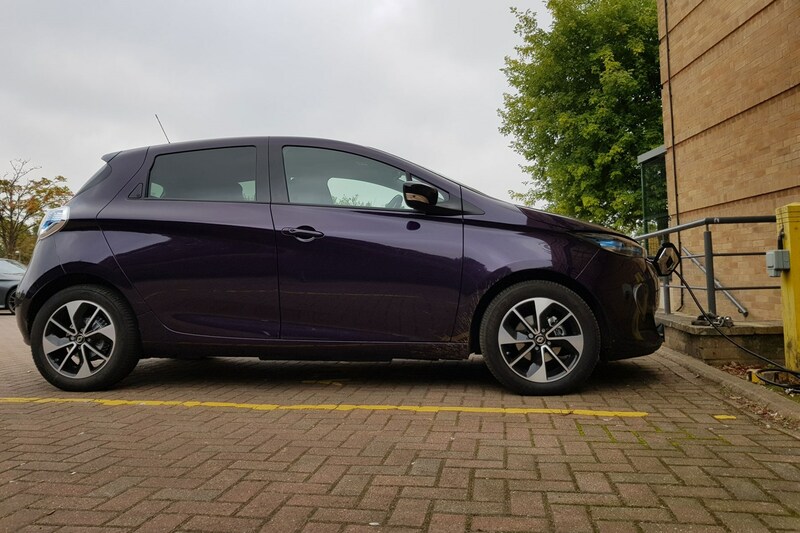 Firstly, our long-term Zoe is one of the newer batch with a longer range and, courtesy of my Nissan Leaf long-termer, I have a wallbox charger at home. Sorted. How did the commute go in the Zoe? For a car designed primarily for urban use, whooshing along a dual carriageway in near silence (save for the wind noise around the door mirrors and rumble from the tyres) the Zoe proved to be surefooted and more than able to not only maintain a steady 70mph, but also to get up to that speed swifty. When I left the office car park the Zoe had an indicated range of 131 miles, but a 40-odd mile slog on the A1, followed by a couple of legs of the A46 had deducted 75 miles from that tally, despite only covering 50. A detour through Lincoln’s urban rat runs revealed the regenerative capabilities of the Renault. Not in a Doctor Who sense, but the way in which the batteries get a bit of an electrical energy while you brake. Despite traveling around 10 miles at speeds of up to 40mph (but usually less than half of that) there was only a two-mile net deduction in the overall range. Some 15 miles of B-road hustling later and I’d rolled into the driveway with a claimed range of 46 miles on the display. Socket behind the front badge uncovered, cable attached to the wallbox and the car. Job done. Except 20 minutes later came a sign something was amiss. So, there I was being forced to endure yet another gripping episode of Hollyoaks when the telly went off. As did everything else electrical in the house. Apart from my daughter’s rage at missing out on that televisual drivel – that went through the roof. 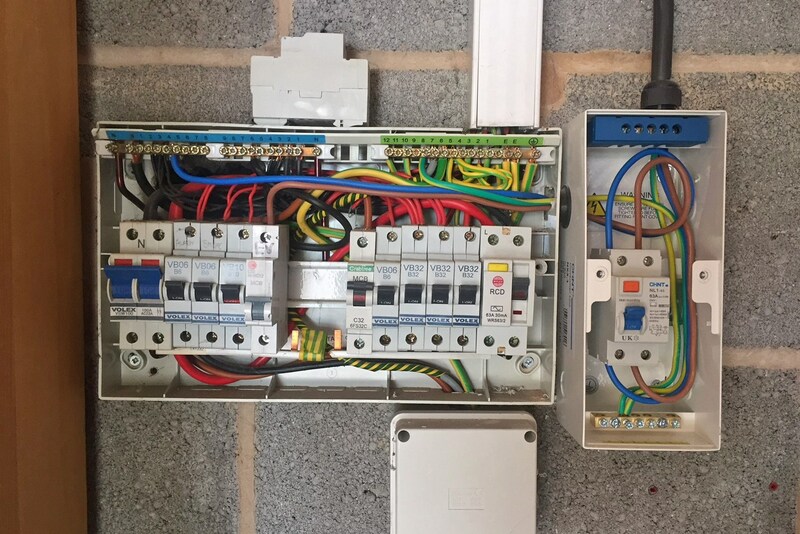 A quick dash to the consumer unit in the garage was thwarted by the fact the front door’s electric (I know, I’d be thinking it, too…), so I had to dart through the house instead via the utility room (can this update become any more middle class?). Sure enough, the electrics had been tripped, so I promptly reset it so that everything came back on. Which it did, for three seconds, before tripping again. This happened a further five times before I called the Chargemaster helpline, during which I was told that Zoes cause difficulties on some installations because of earth leakage. In layman’s terms, this earth leakage is higher on the Renault than any other electric car, and much higher than domestic set-ups tend to experience. 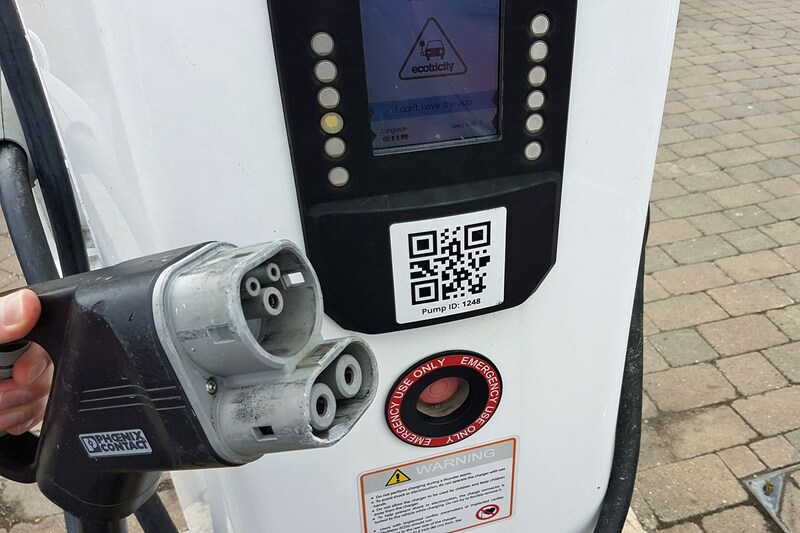 The only solution was to arrange to have a ‘filter’ installed – essentially a trip circuit solely for the electric car charging point. That’s all well and good, but I still needed to charge-up the Zoe. Checking out various electric car charging point apps, it seemed my best solution was to drive into Lincoln – using around 15 miles of range in the process. I tootled off and headed to a multi-storey car park in the centre of the city, with two charge points conveniently located on the top floor. Both were free (as the app had suggested when I left home), so I connected the car to the charger. Unplugging and re-plugging the leads continued to do absolutely nothing. Frustrated and running low on range, I set off to a nearby Tesco. All four charging points were free, although it was slightly frustrating to discover that it was only as fast as my 7kWh domestic wall box. Concerned as to whether there’d be a problem, I decided to put the Zoe on charge, but to sit in the car for 15 minutes until I had confidence it was going to work. I’m pleased I did because as much as I needed a coffee, by 14 minutes the recharging had failed having only increased by 4%. ‘Sorting’ it seemed to require nothing more than unplugging and re-plugging again, but the pattern continued. Typically every five to 15 minutes there’d be a clunking sound as the flow of electricity to the Renault was halted, requiring me to get out, unplug and re-plug. At least it wasn’t raining, but by 1am I was ready for that coffee more than ever. And to use the facilities. And to sleep. And I still wasn’t back up to full – 80% would have to do. 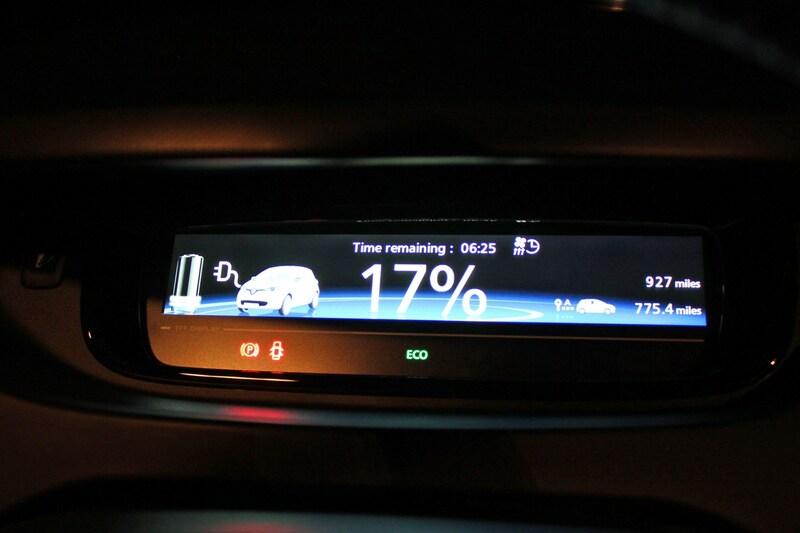 Despite not having a full battery reserve, I was confident the return leg to the office the following morning wouldn’t be too range-anxious, and so it proved – parking back up in the electric bay with 18% to spare. Of course, it fully recharged on the car park connection without even a hint of an issue. 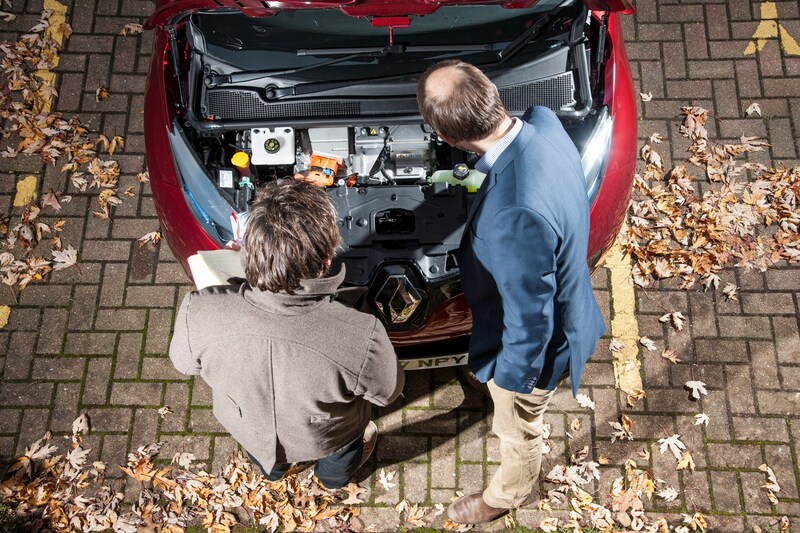 A few days later, Andy the Chargemaster installer came back to add in the extra trip filter, explaining that it’s the way that the motor in the Zoe charges the battery that causes the earth leakage problem. ‘We don’t experience it with any other plug-in car,’ he confirmed. With the new kit installed, the only thing to do was bring the Zoe back again to try it out, but for a week I bottled it, such was my daughter’s Cheshire-based, soap-opera-missing wrath the first time around. I needn’t have worried – when I eventually brought it back, the car – and the charger – performed faultlessly. The moral of this tale is twofold: firstly, ensure that your wallbox installer knows that you’re getting a Zoe, thus requiring the extra ‘filter.’ The second? Quickly find out which public chargers in your usual haunts work with the Renault – it’ll save you from getting stranded. It has become something of a tradition for my long-term test vehicles to at some point end up transporting parts for my actual car – a mildly temperamental Mk1 Mazda MX-5 (which to be fair to it, is only temperamental because it’s no longer exactly as the factory intended). And so it is with my most recent Zoe adventure, where I found myself in Peterborough, needing to collect a set of petrol fuel injectors in Milton Keynes while still being back in time for lunch. As a round trip, that’s about 120 miles. The Zoe’s predicted range when unhooked from the work charge point was 140 miles before setting off – sounds perfectly fine, right? But I know from the A1M on my daily commute that if you really put your foot down in the Renault the range rapidly starts dropping through the floor. And given Keith’s charging tribulations detailed in the last report, I was really hoping to avoid dabbling with the public charging network. So a more considered approach was definitely in order. Engage Eco mode, and relax. 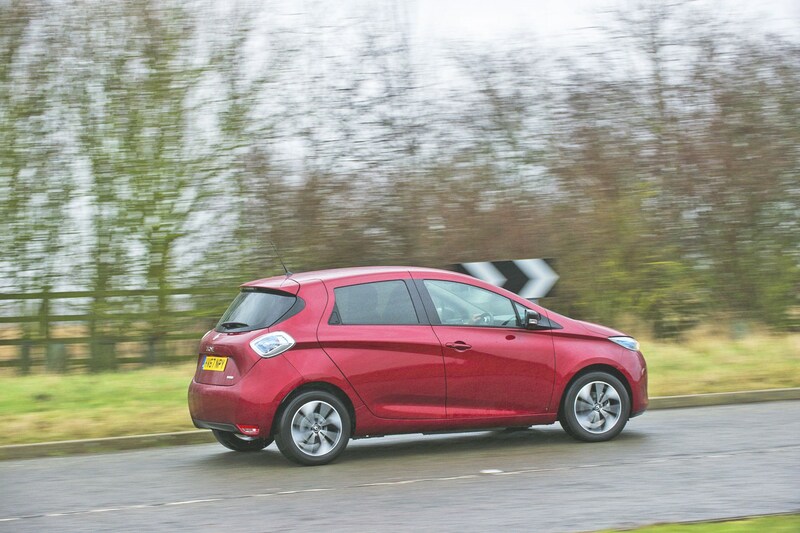 Among other things, Eco mode limits the Zoe to 60mph and saps its acceleration, so you have to be a bit sensible about when to not use it – the tricky Alwalton exit onto to the A1, for example, is best tackled with full power available. 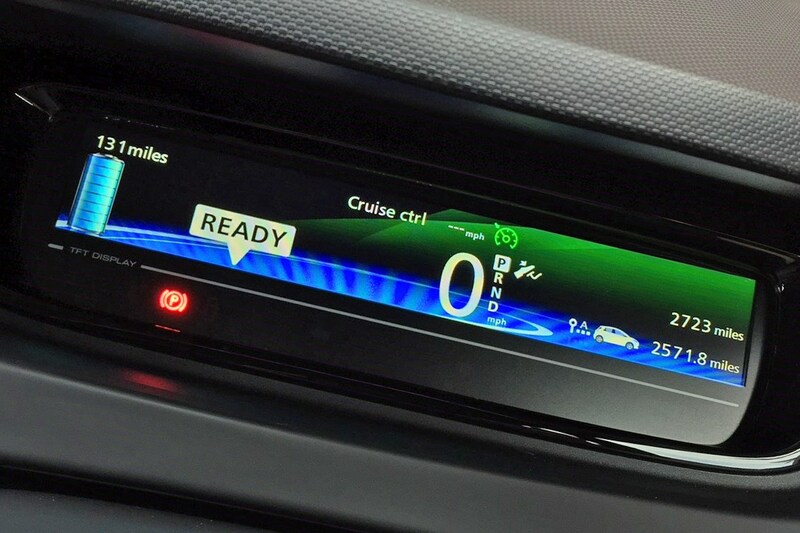 Don’t worry if you forget, though, as if you flatten the accelerator the Zoe seems to know what’s up and gives you maximum beans even if you’re not in normal mode – a frantically flashing Eco light its only protest. Those situations aside, however, 60mph on the cruise control was clearly going to be my friend, and for the first time in my life, hitting those average-speed-camera-enforced 50mph and 40mph roadworks was like heaven. About 20 miles into the journey I’d already boosted range ‘cushion’ by a further five miles, and I began to feel confident I wasn't going to get myself idiotically stranded. I was also, admittedly, getting rather bored. Fortunately maintaining momentum around the MK roundabouts soon solved that problem, and the injectors were collected. I was up to around 40 spare miles by this point, so the return journey was a little quicker – I may even have gone as fast as 70mph where conditions allowed. I know; what a risk taker. All this waffle does have a purpose. Once again, the Zoe has totally failed to give me a nail-biting range-anxiety experience. Yes, I had to drive with some consideration, but the Renault’s range meter don’t lie – if it says it can go the distance, it can go the distance. Or in this case, even further. Once back at the office, injectors dropped off at a local garage for cleaning, I returned the Zoe to the plug. And when I detached it again to get home that evening, the predicted range was up to 160 miles – one of the highest I’ve yet recorded. That my electric car now smells faintly of petrol is a moment of unexpected nostalgia I’m frankly embracing. More on the Zoe’s relationship with public chargers next time. So. 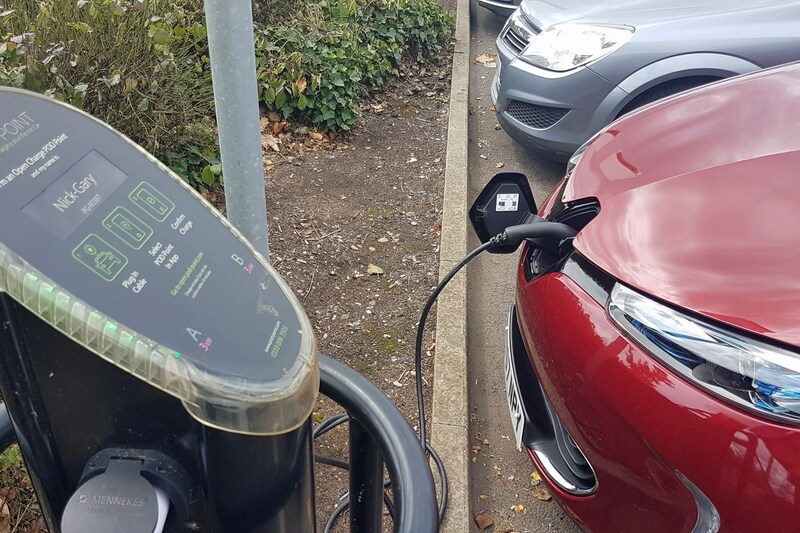 Not so long ago Deputy Editor Jones borrowed the Zoe to test his newly installed electric car charger, and it didn’t exactly go very well. 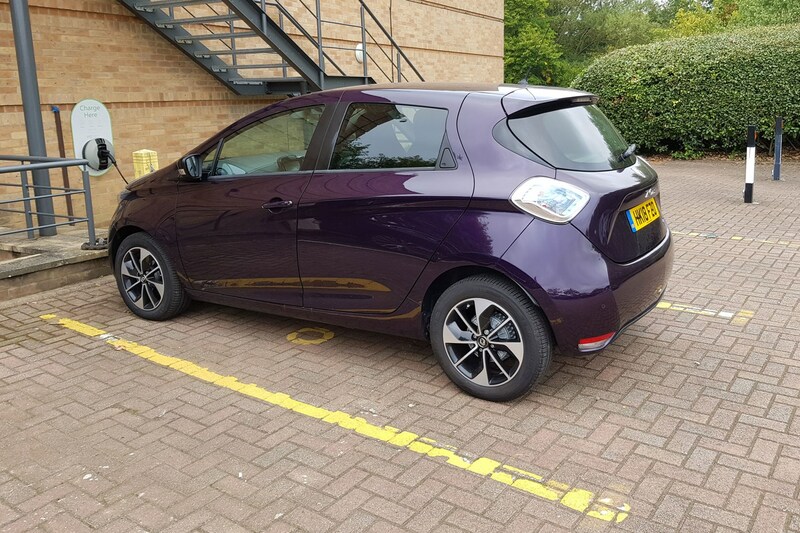 That the Zoe tripped out his household electrics because the charger hadn’t been prepared for the Renault’s idiosyncrasies is perhaps understandable – after all, it took a while to get the ancient Pod Point here at work to cooperate. But for Keith to have such trouble finding a public charger in Lincoln that would talk to the car did rather set alarm bells ringing. 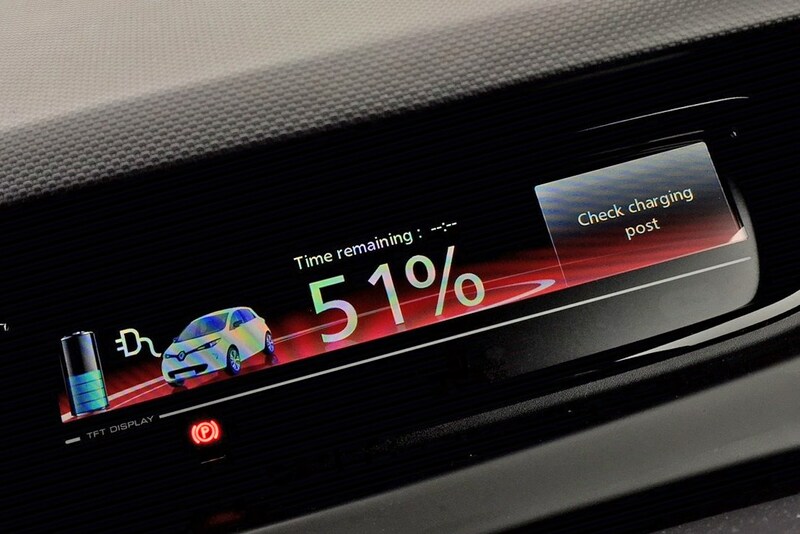 Was there a major problem with the Zoe’s charging performance that had somehow slipped under our collective radar? I mean, we were aware that every charge-point installer seems to mutter darkly about them being ‘difficult’, but surely it couldn’t be impossible to charge one at all? Owners would be up in arms. 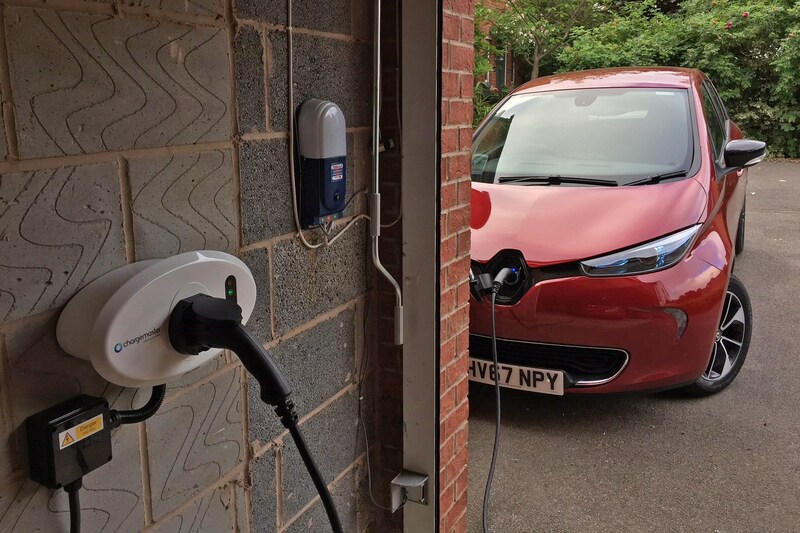 It is entirely possible that most Zoe owners do what I do: charge the vehicle at home, at night whenever it becomes necessary – which is increasingly infrequently as the summer months and warmer weather have rolled on. Electric car batteries like warm weather. Anyway, as a result of this, I’ve never had to use a public charger. So I actually had to download a few apps to try and find some in the local area. This done, we decided that rather than take the Zoe out to try them on its own, we’d bring along Parkers’ two other electric long-term test cars to make sure any issues we had with the Renault were genuinely specific. 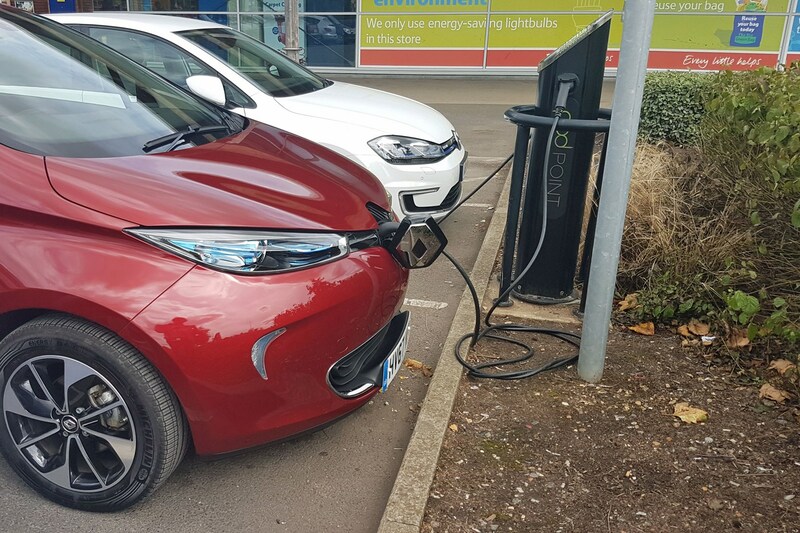 Turns out we needn’t have bothered, because everywhere we plugged the Zoe in around the Peterborough area worked just fine. Even an ancient looking free charger at a supermarket. 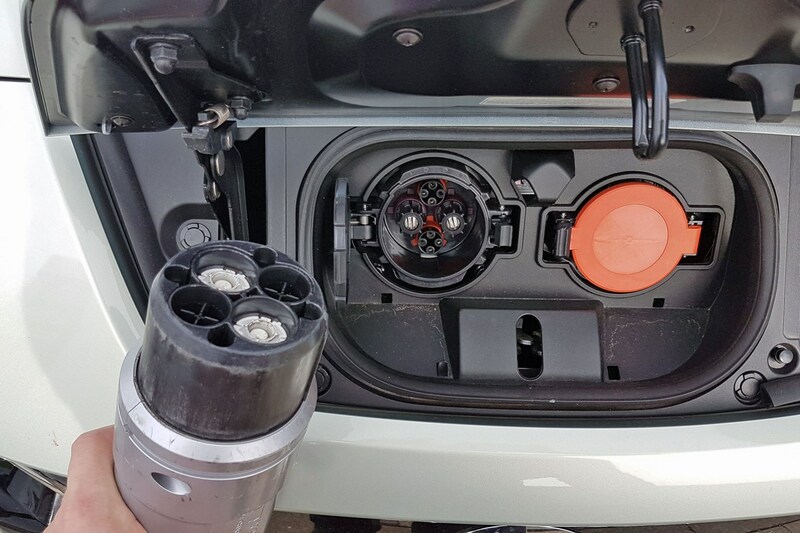 It was slightly frustratiing that the Zoe only has the one type of charging connector, when both the VW e-Golf and - especially - the Nissan Leaf have more flexibility than that. Despite this, the whole exercise looked so pointless, so quickly, that we canned visiting every charge point in the vicinity and settled for the 100% record at the ones we did stop at. 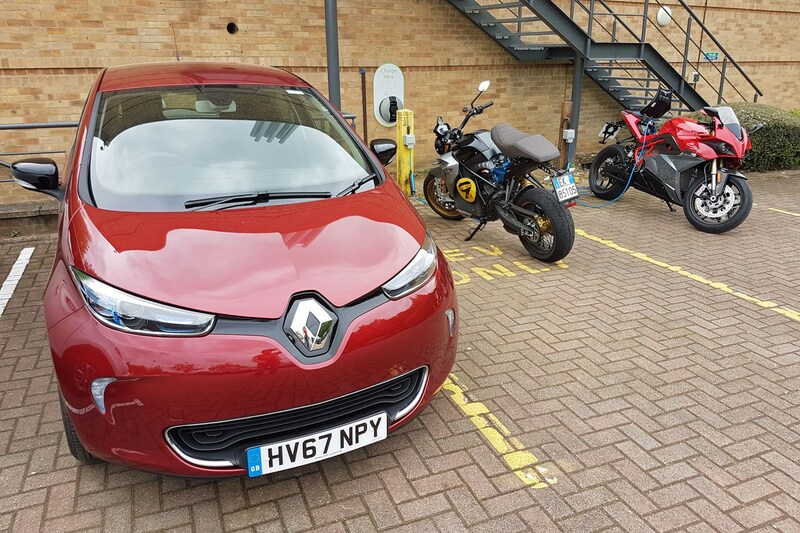 I do still plan to check a few around Cambridge as well for further clarification, but for the moment it seems the only issue with using the Zoe on the public charging network is arriving to find someone else is plugged in. Unless you live in Lincoln, it seems. More anon. Uh-oh – is our long-termer out of date already? This was supposed to be direct comparison between my long-term test Zoe Q90 and the Zoe R110 – which was introduced as part of the 2018 model year update and boasts, as the name suggests, a more powerful motor. However, since the Q90 is currently – as usual, no pun intended – being repaired following a minor incident at a roundabout I’ll have to make do with talking about the R110 independently. Whoops. First things first, how awesome is this new purple colour? Called Aconite, it’s exclusive to the R110, and everybody who saw the car commented on it in a positive way. Distinctive colours are the thing right now as far as I’m concerned (don’t get me started on the satin gold Seat Ibiza that belongs to a workplace car park hero), and this one really suits the little Renault’s design ethos. 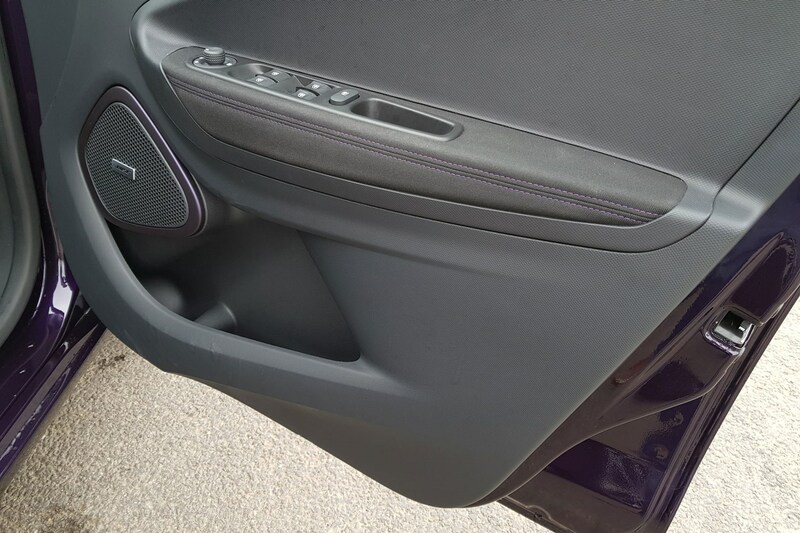 Would I go so far as to combine it with the optional Purple Interior Pack of this particular example? Sure, what the hell. This is an bold choice of car given electric automobiles are still in their infancy, so why not be bold with its appearance. The Q90 has 88hp and 221Nm of torque – the latter delivered instantly for a nippy urban experience and easily enough urgency to keep pace with motorway traffic. I rarely find myself wishing it was faster. Which is good news for the R110, since it doesn’t initially feel any quicker. The new motor has 107hp and 225Nn, so while it packs a decent 19hp more it’s not got a massive extra shot of muscle, meaning its barely any quicker off the mark. 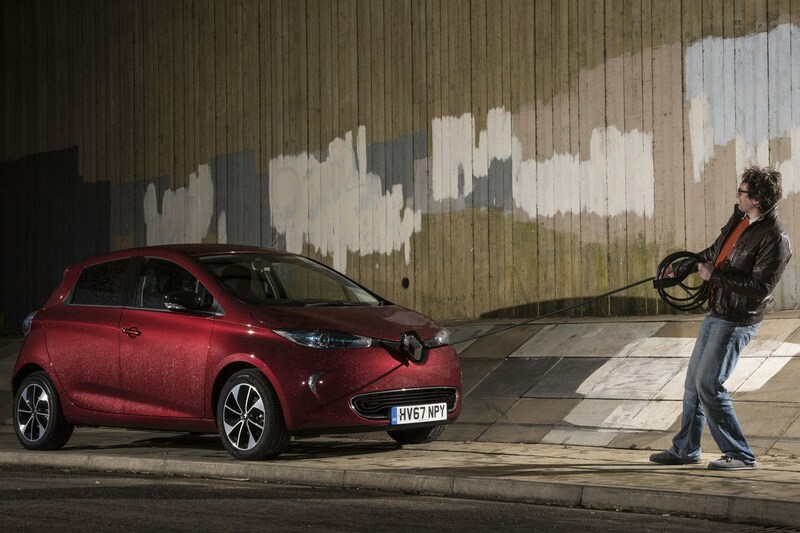 Once you’re rolling you do start to notice those extra electric horses; Renault claims it’s two seconds quicker from 50mph to 75mph, which among other things makes easier work of blending speeds on slip roads. Even so, there’s not enough of a difference to make me feel disappointed about the Q90’s capabilities. As I’ve remarked before, the Zoe doesn’t really bring out the competitive driver in me – I’m happy just tootling along in these machines. Still, Renault has achieved the R110’s additional performance without any weight penalty, and this Zoe continues to offer an impressive real-world driving range. In the warmer weather during the loan period it was indicating 160 miles would be possible between charges. And that’s not even the best news. The best news is that the R110 actually costs less than the Q90. Wait. How can a newer, more powerful car cost less? It’s not a huge difference – £750 at the time of writing – and no doubt Finance Editor Chris could probably find some ways around it, but it’s an odd situation. Until you remember that the Q in Q90 stands for its built-in quick-charging system, which means that given access to an appropriately powerful charger you won’t be waiting as long to replenish the Q-car’s batteries. Frankly, I’m not sure that matters, though. The Zoe continues to make most sense in a usage case where you have enough spare juice capacity during daily driving that you can simply charge it up at home every night and then carry on again the next day. In which context the Q90’s speedier rejuvenation isn’t really much of an advantage. In other words, you’d be mad not to buy the R110 at this point in time. I have recently become a father for the first time. Life is at once more joyful and more complex (not to mention tiring…) than it was before. And one of those complexities is whether or not all the extra kit we now need to cart around will fit in whatever vehicle I’m driving. 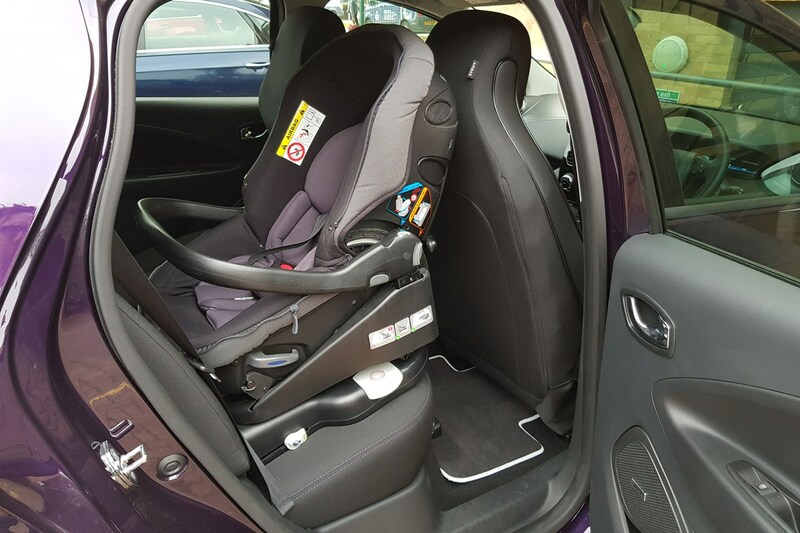 Buggy, car seat, seemingly endless bags of add-on equipment that would have made my pre-baby mind absolutely boggle, are now a routine part of moving my family around. I’m pleased to say that the Zoe is actually pretty practical in these terms. 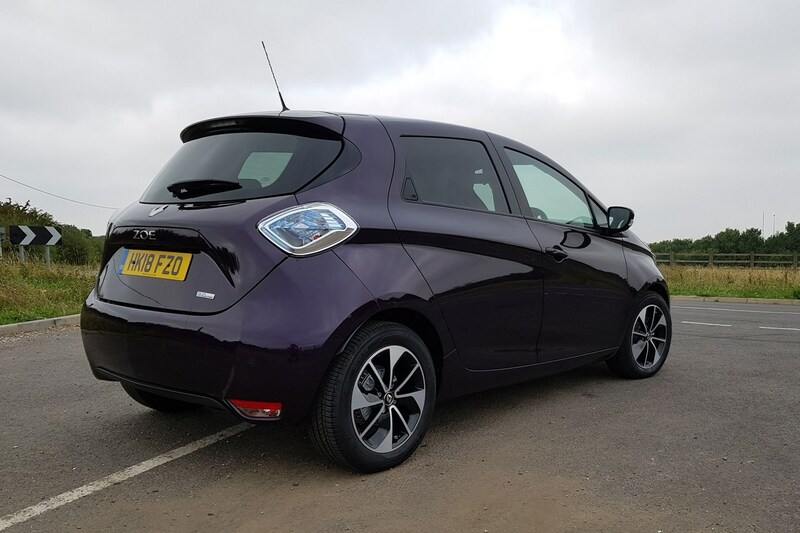 Since the Zoe Q90 long-termer is still with Renault, the pretty purple Zoe R110 is functioning as the stand-in model for these pictures – which only makes a difference in that this R110 has a Bose hifi upgrade, adding a big box of sonic hardware stuck to the boot floor. 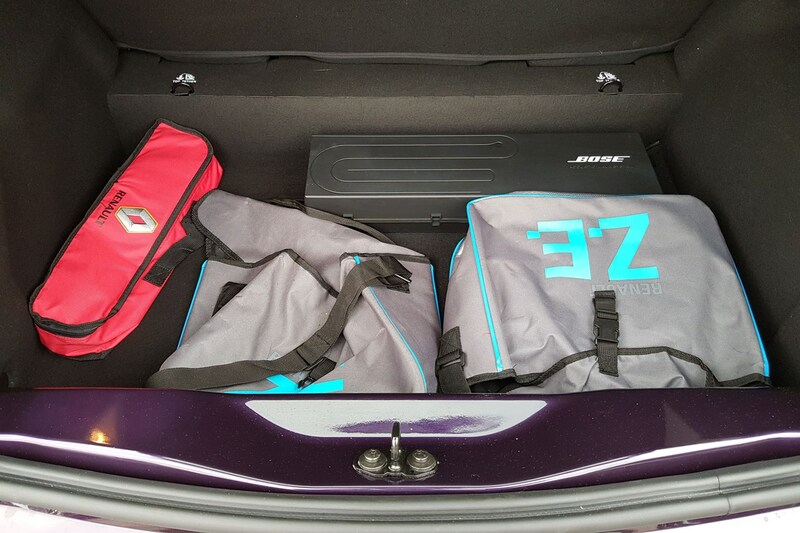 Even with this joining the twin bags for the three-pin and proper charging point cables, however, you can see that the Zoe’s boot is basically enormous for a car of relatively compact dimensions. The flexibility of battery power versus the safety demands of fuel tank location, I guess. 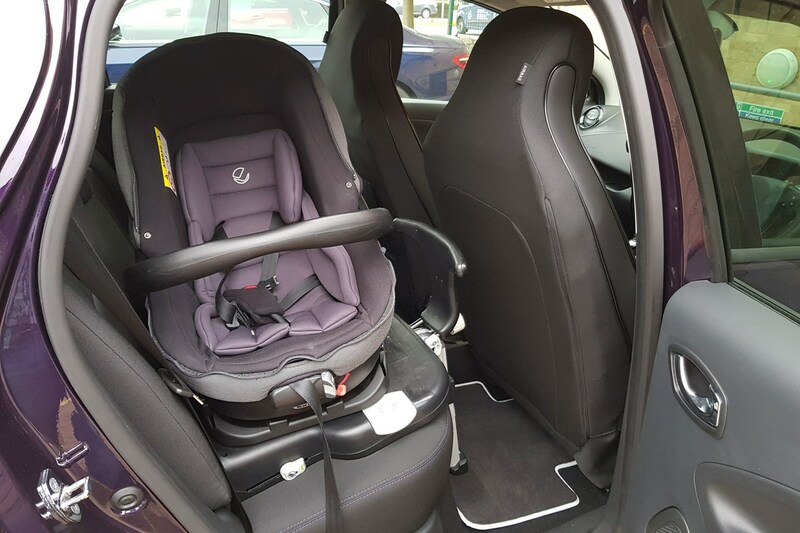 As you’d expect of a modern car, the rear seats have Isofix mountings – and there’s plenty of leg room in the rear footwells to make installing our swivelling base unit easy. The Zoe also has keyless entry, which I’m starting to really appreciate now that I’m a Dad – not having to dig a key out of a pocket is potentially a godsend when you’re carrying the most precious thing in the world, though Renault’s weird keyless logic means you do have to remember to not lock the car on the key in order to be able to get back in without using it. What’s less practical in this context are the hidden handles on the rear doors – which are awkward to operate at the best of times, and more so than with most rival examples of this practice. It doesn’t surprise me that most manufactures that try this trick often abandon it for subsequent model generations. 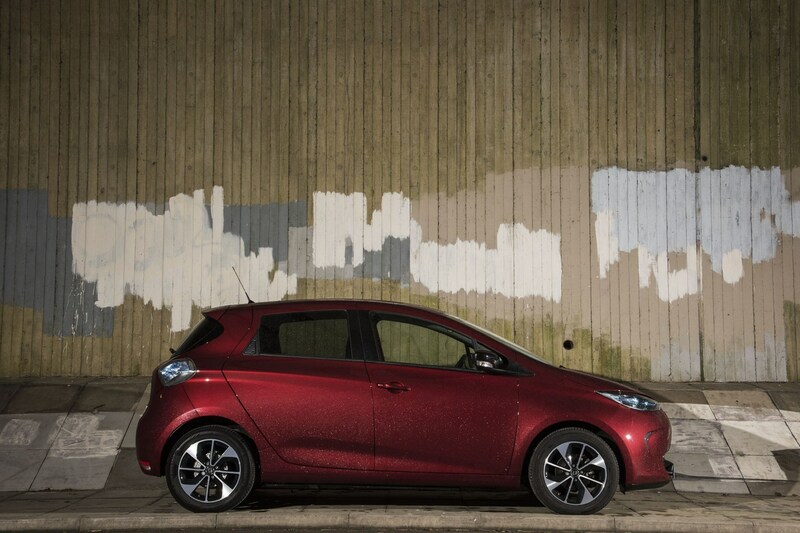 So, at a basic level, the Zoe takes family functionality very much in its stride. Unfortunately, however, its primary attraction of being an electric car has suddenly become a reason to pause for thought.